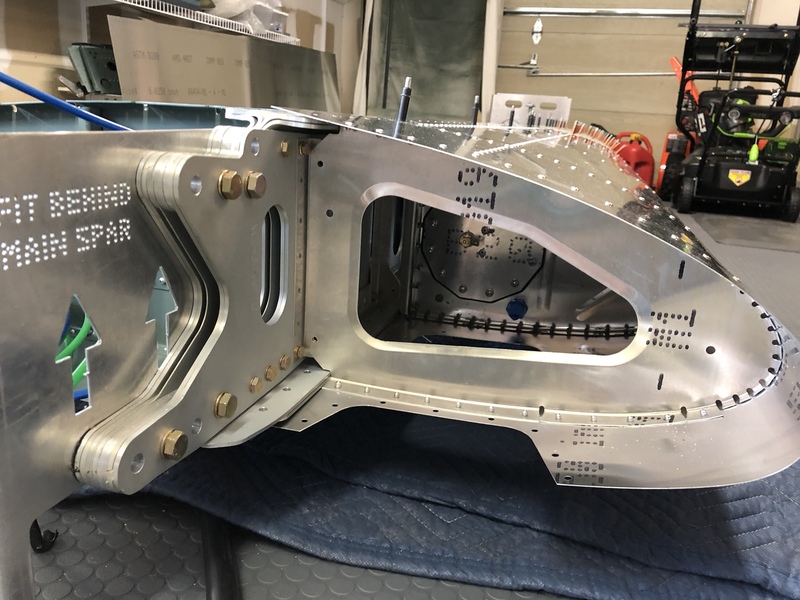 I finished assembly of the left side flap. 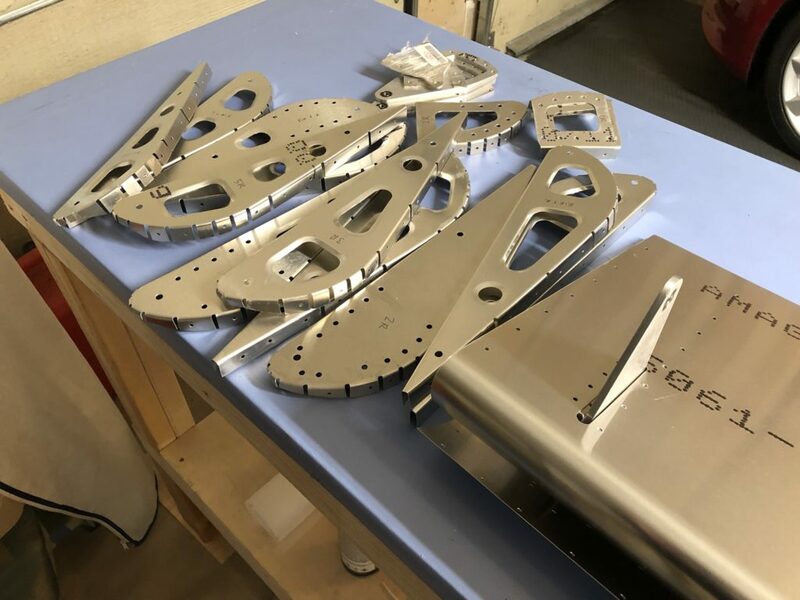 All the parts for the right side are prepared, but I’ll wait to assemble it until I see if I run into any fit issues with the left side. 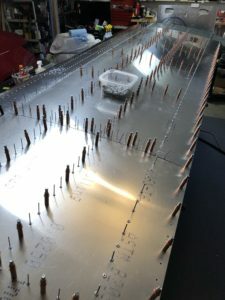 I started preparing the aileron structural parts next. 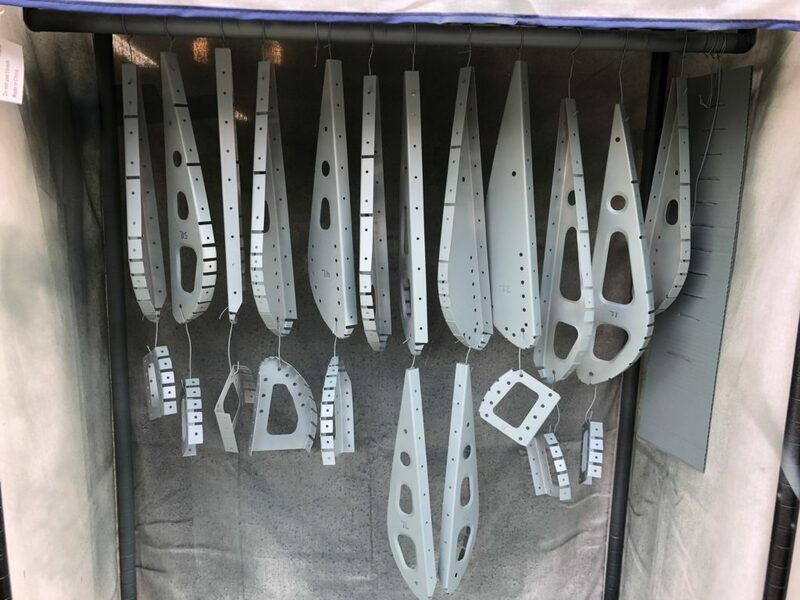 They go through the same process as the flap structural parts – deburring, cleaning, and priming. I also took some time to smooth out the shape of the tabs on the ribs, so that they more closely match the curve of the skin. In some cases, I have to file a small notch before I can bend the tab. 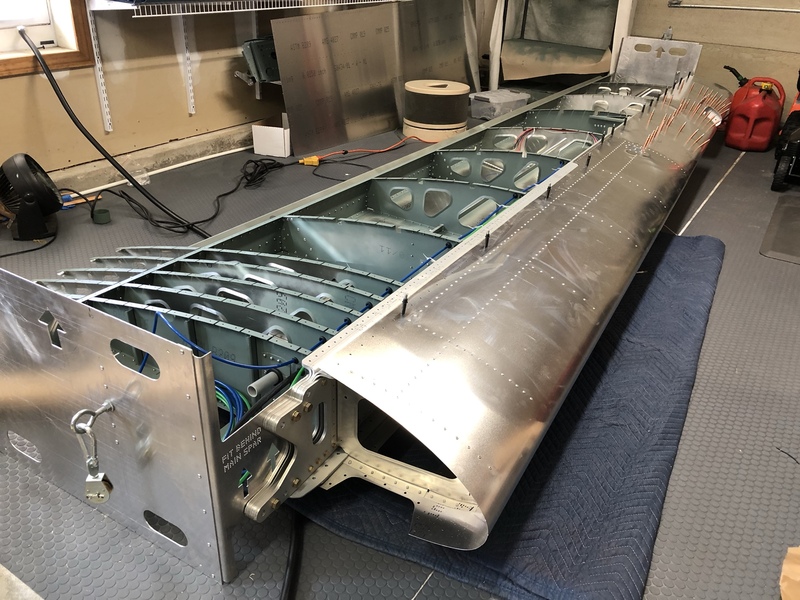 A before-and-after picture is shown below for aileron rib # 4. I use an adjustable crescent wrench to make these bends. Same rib after I notch the corner a little with a round file, which allows me to bend the edge of the tab, giving it a slight curve. 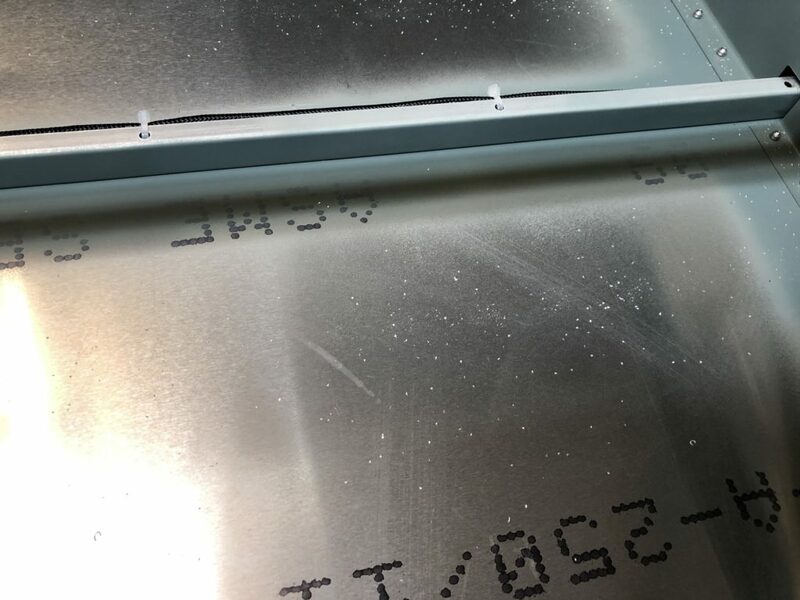 I guess I should sand out those scratches I caused – but they’re pretty superficial. 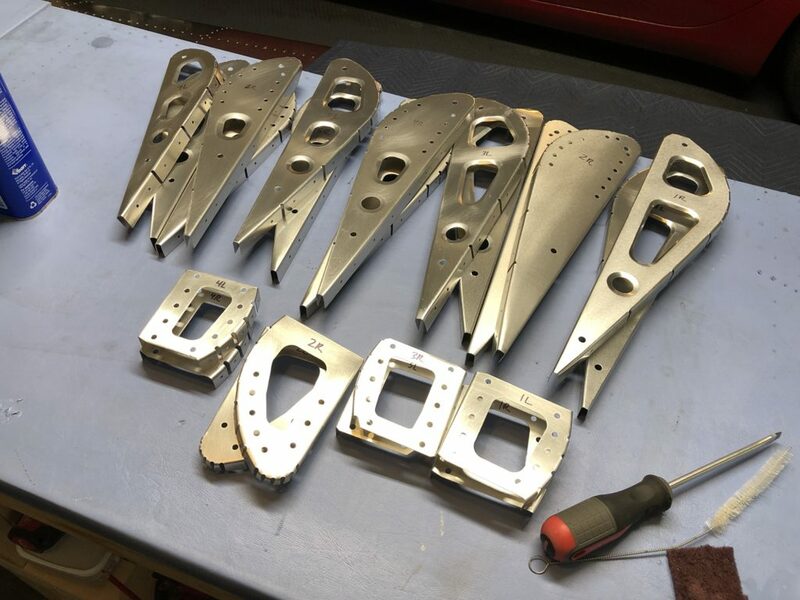 With most of the left wing complete, I prepped the flap parts today for both left and right sides – it’s just easier to do all at once. 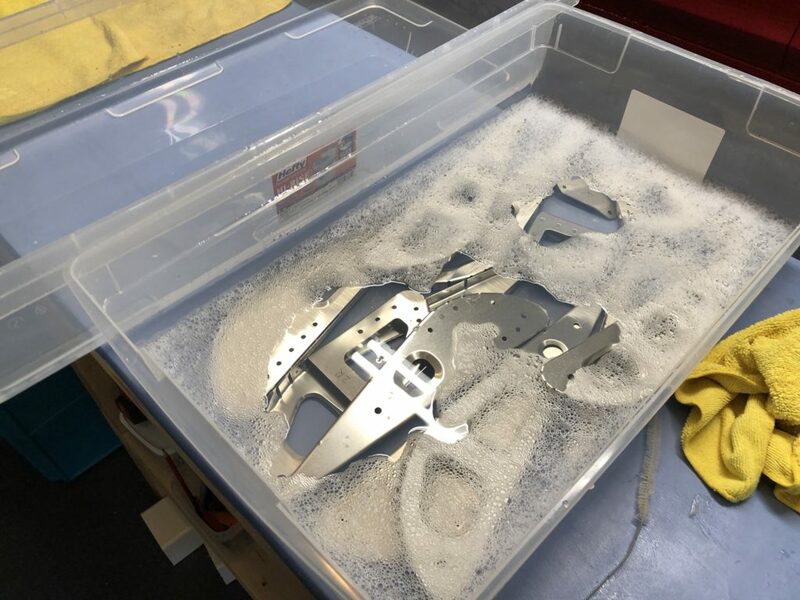 I had to pull out the part bath tubs for the first time in a while, as well as my “paint booth” so that I could prime a bunch of parts at once. 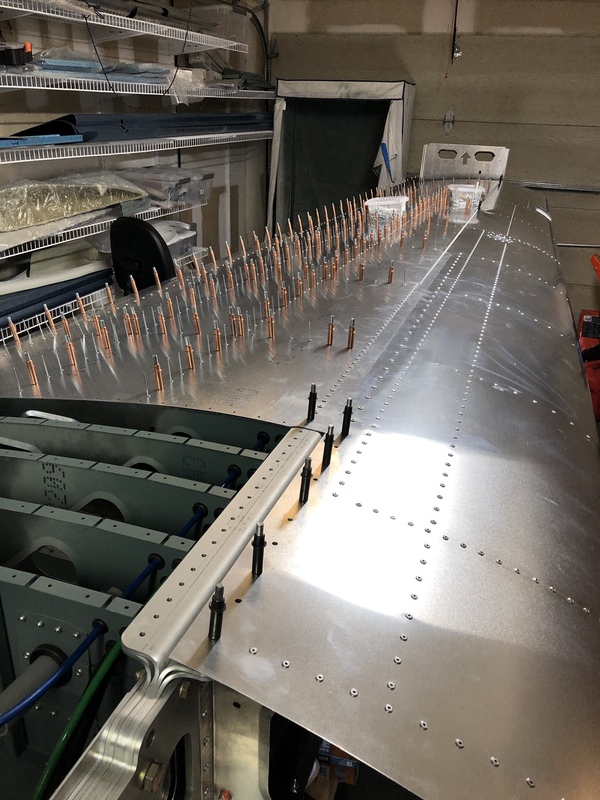 Ailerons are next, but as I understand it there’s some more work involved with those to get them lined up well with the rest of the wing trailing edge. Here’s a gallery of Friday’s efforts. 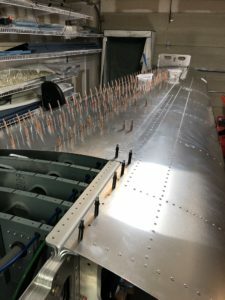 Last weekend I riveted the upper skins on the left wing. 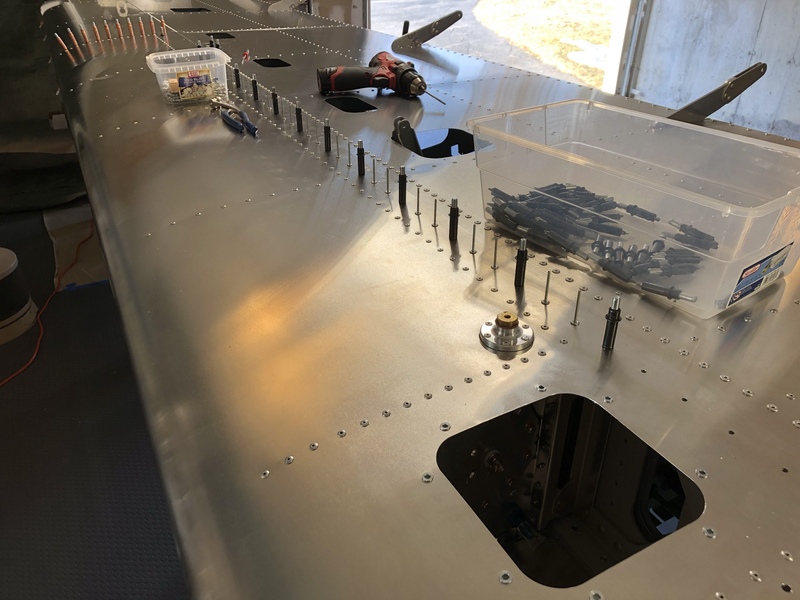 As I did when clecoing the skins in place, I started riveting onto the strongest parts first (4mm rivets into the main spar cap), then ribs, then stringers. 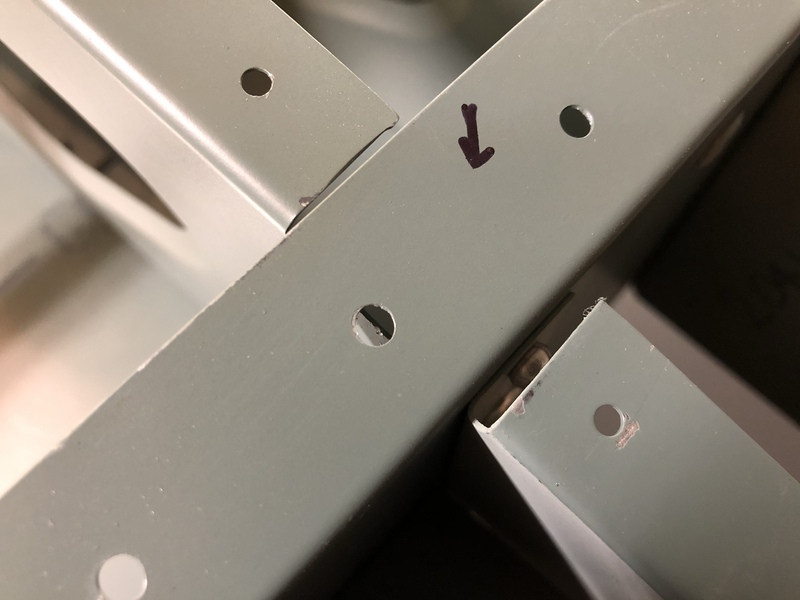 When pulling these blind rivets, it leaves an open hole that should be filled in. 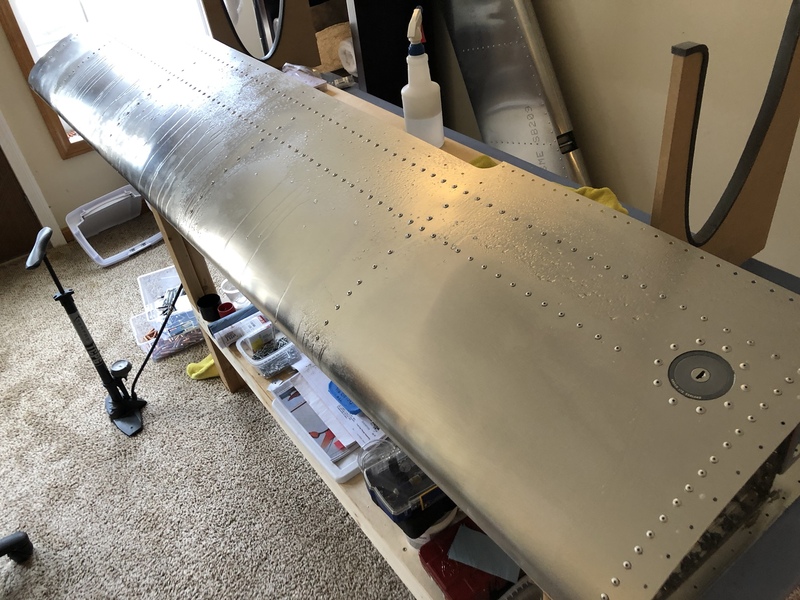 I borrowed an idea from Craig Maiman, who in turned got his idea from Kit Planes magazine, to use a light-weight spackle to fill in the rivets. 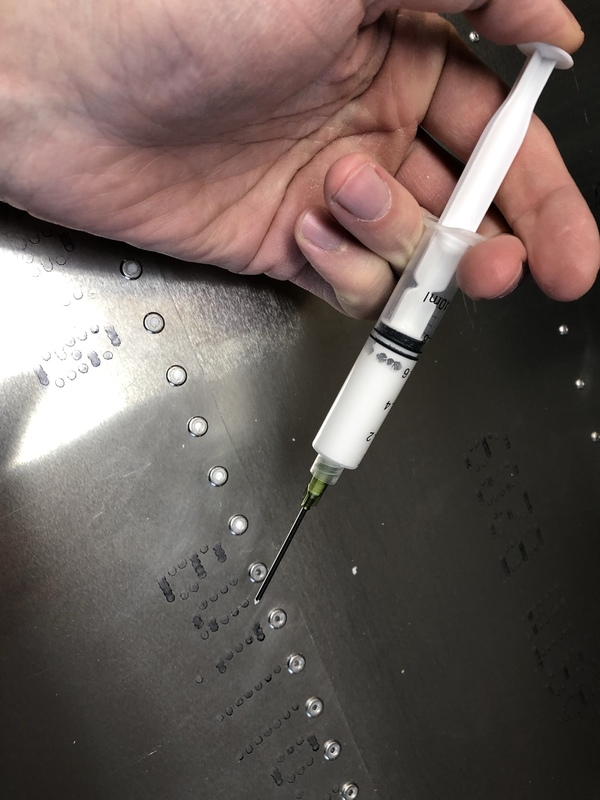 I bought some from a local Sherwin Williams store, and filled a syringe with the material and then injected it into the rivet cavities. It comes out in a creamy/pasty consistency, and then hardens relatively quickly (within an hour) so that it can be sanded smooth. Short GIF video of filling the cavity – almost like dental work! I wanted to add the step skins next, but I found an issue with fit of the skin. 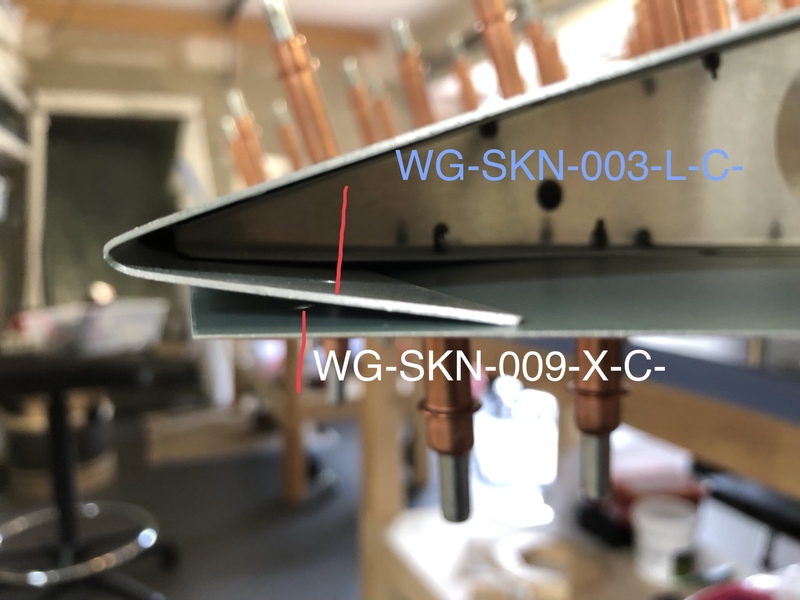 Specifically, the holes in the top step skin (WG-SKN-003-L-C-) did not line up with the bottom skin & ribs. My assumption was that the skin was bent incorrectly, which was confirmed by TAF technical support. 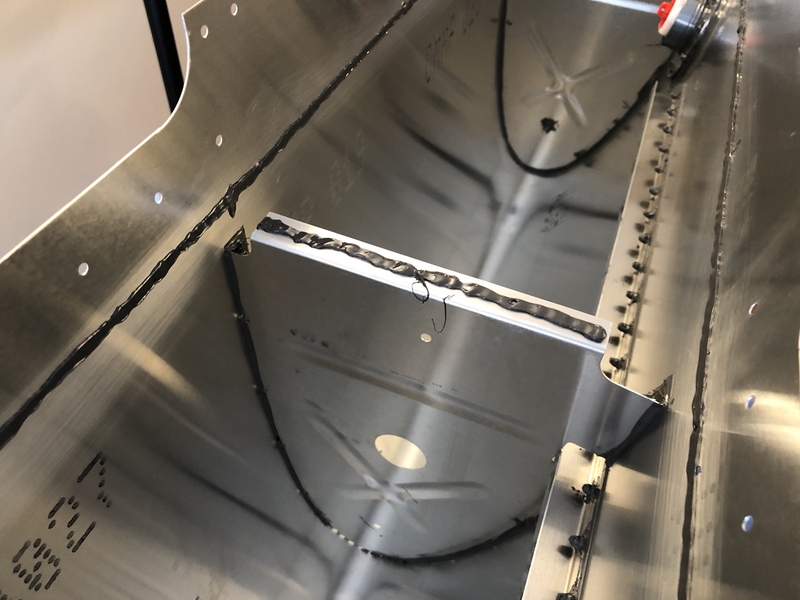 This skin is pretty thick material, so there’s no way I can fix this myself – and besides, aluminum doesn’t like to be re-bent. 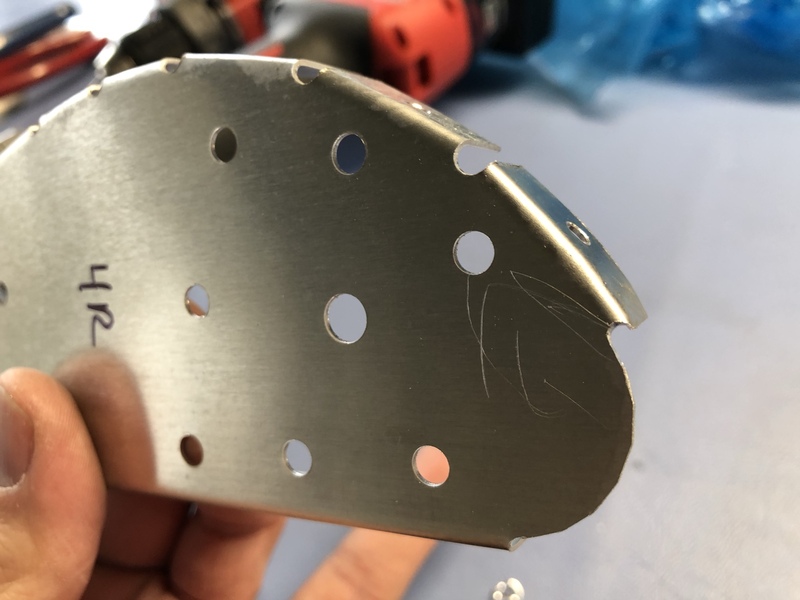 I thought about drilling new holes, but because the mis-alignment is about 2.5mm, and the holes are 3.2mm in diameter, I would wind up creating a slot instead, and the rivet possibly could pop out over time. Instead, TAF will be sending me a replacement skin. The bend of the upper step skin tucks between the lower skin and the ribs (which is what this lower skin is attached to with clecos in this pic). 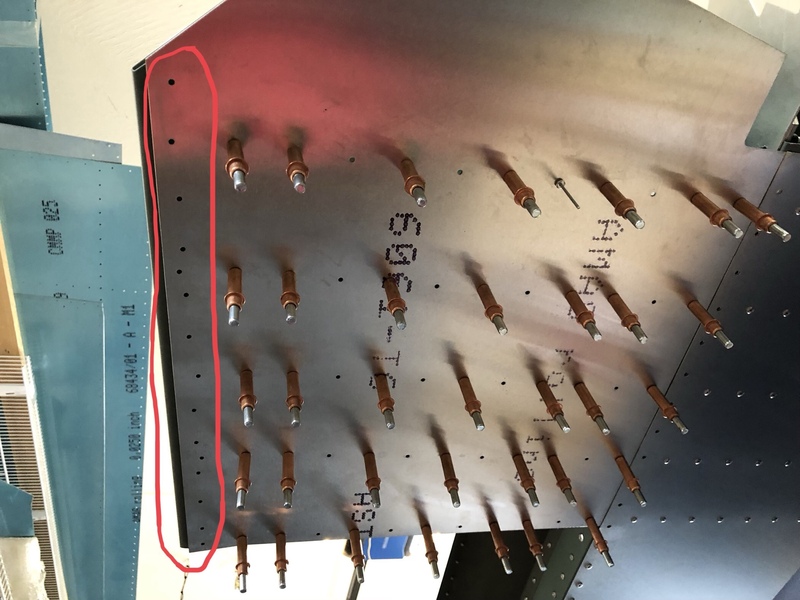 But because the holes in the top skin are misaligned in the red circled area, I can’t get any clecos in there. Pretty clear to see the misalignment in this pic. The red circle is where the rivet hole is on the step skin rib. Since I had this issue with the left step skin, I decided to check the right side skin, but that one looks to be OK. 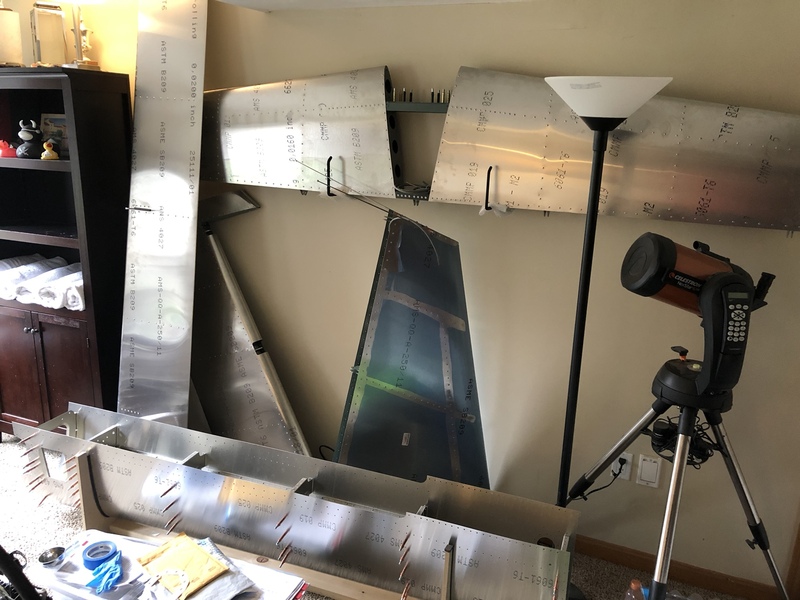 While I wait for a new step skin, I’m going to build the ailerons & flaps, and then get started on building the right wing. 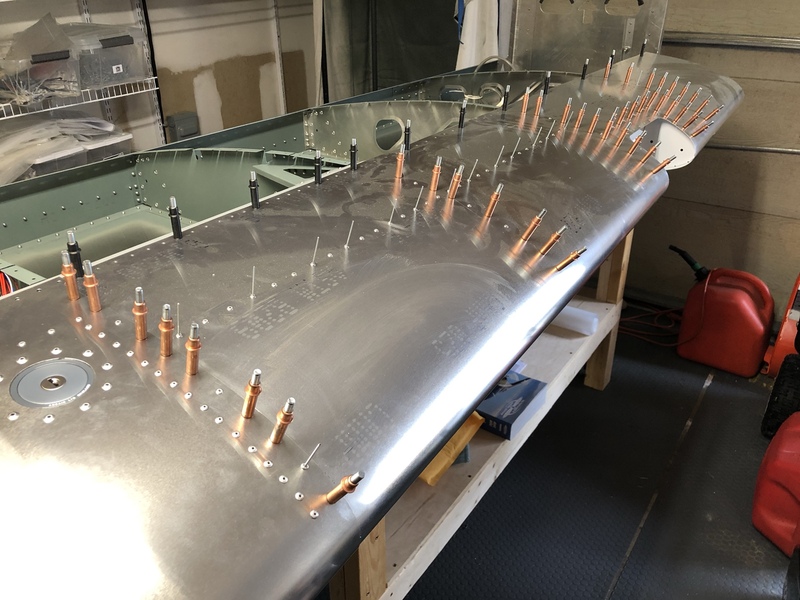 After I spent two hours on Tues night taking a chucking reamer to most of the rivet holes, there was indeed a lot of metal shavings inside the wing so I started with vacuuming that all out. After vacuuming, I had a few holes to investigate why I couldn’t get a rivet to sit flat. In two cases, there is a rib edge directly underneath the hole, so I filed a small notch in those. In other cases, there’s some structure beneath the hole so I’ll just need to use a shorter rivet. 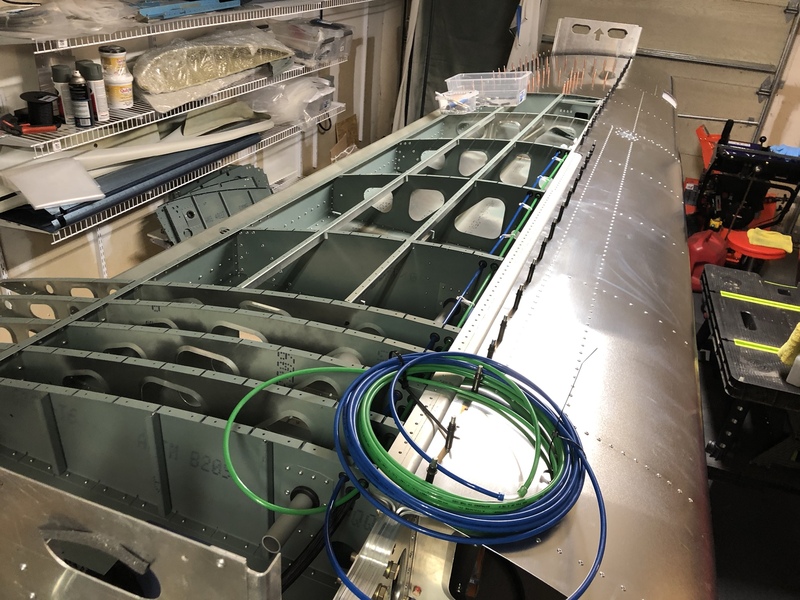 I spent another two hours carefully lining up the skins, first with the main spar, then with the rear spar, finally with the ribs (effectively, starting with the least flexible part, working my way to the most flexible). I find that getting the skins lined up just right definitely takes some patience. 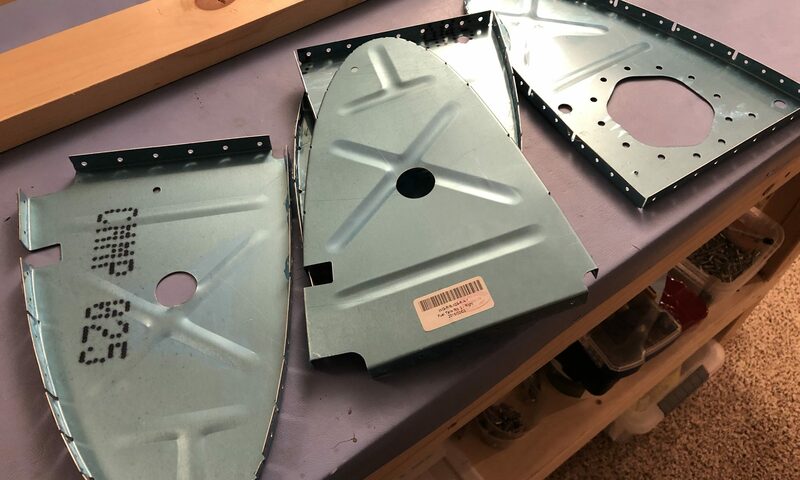 Because the holes are drilled just big enough for the rivet body, a cleco will go into a hole more easily than the rivet, so I found it better to do some initial alignment using rivets in the holes to set the location, then putting clecos in adjacent holes afterwards to clamp the skin in place. I had to use awls to stretch and pull the skin and/or structure underneath into position in some cases . I also checked alignment of inner and outer jigs to ensure no wing twist; they matched within about 0.1°, which is pretty excellent. I should be ready to pull all these rivets next time I work on the wing. 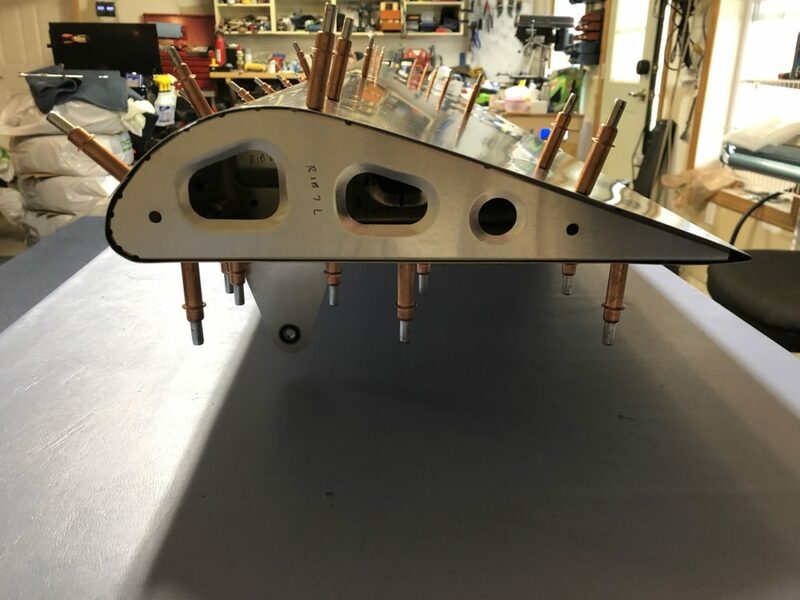 Lots of clecos and rivets, but still more to put in place before I start riveting. I already ran out of 5/32″ clecos just holding down the skins to the front and back spars! Although I’ve had it for a while, I never finished the pitot tube installation on the left wing. It was one of few remaining tasks to do before I close out the wing. I finished up wiring the heater controller module, then took care of the plumbing. 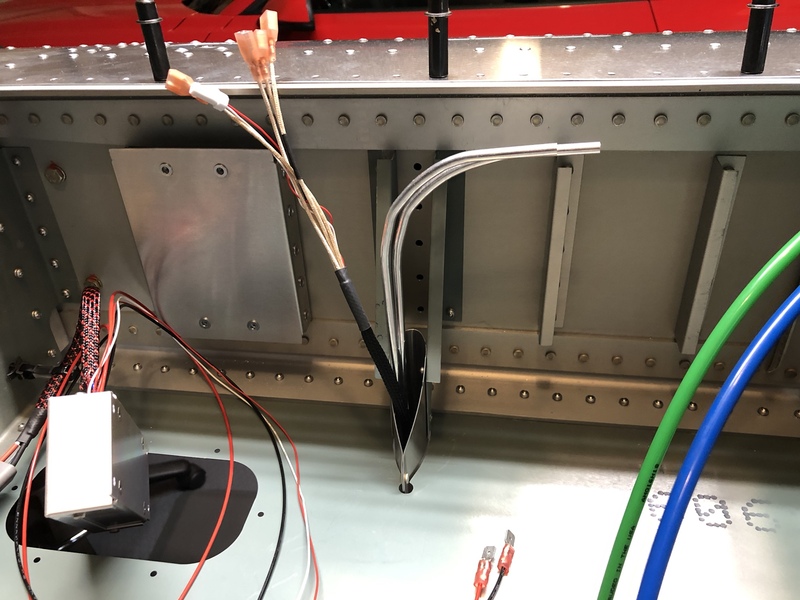 Pitot lines carefully bent using the same tool I used for the fuel tank breather lines. To achieve the gentle radius, I had to bend the pipe a little bit at several points. 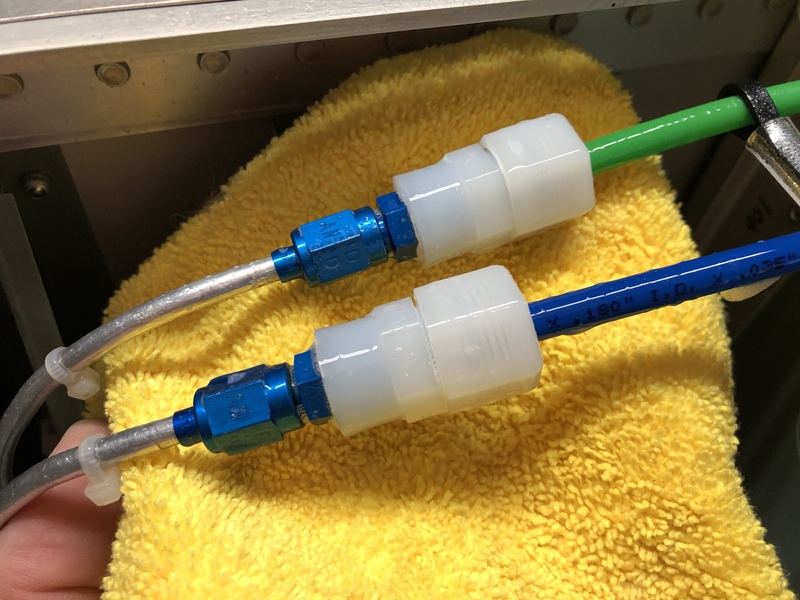 There are a few solutions out there to link together the 3/16″ aluminum tubes from the pitot with the 1/4″ plastic tubing that goes to the fuselage; I chose to use AN style fittings on the aluminum tube, screwed into these nylon fittings that I got from McMaster. BTW, I also bought nylon tubing from McMaster to use instead of the clear vinyl tubing supplied with the sling kit. 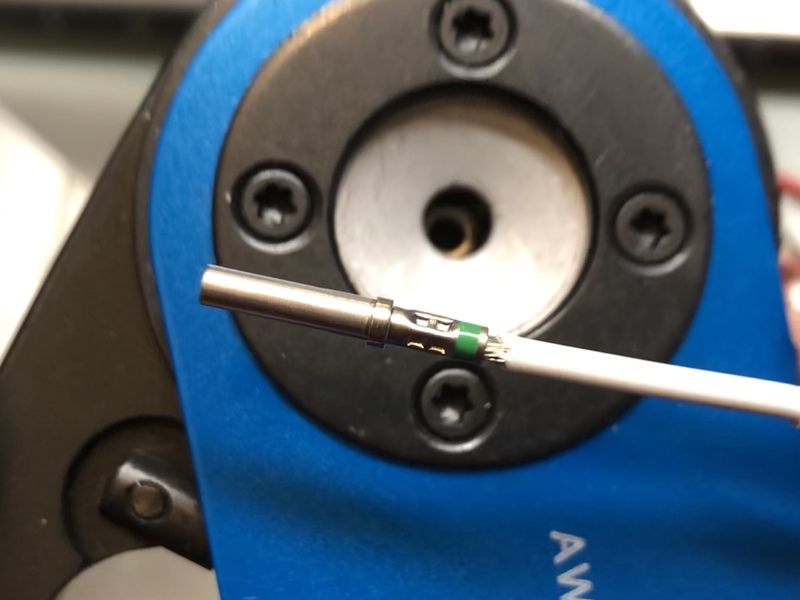 I like these fittings because they form an interference fit on the threads, and the screw-on nut includes an o-ring and a metal gripping ring that bites into the tube to form a tight seal. 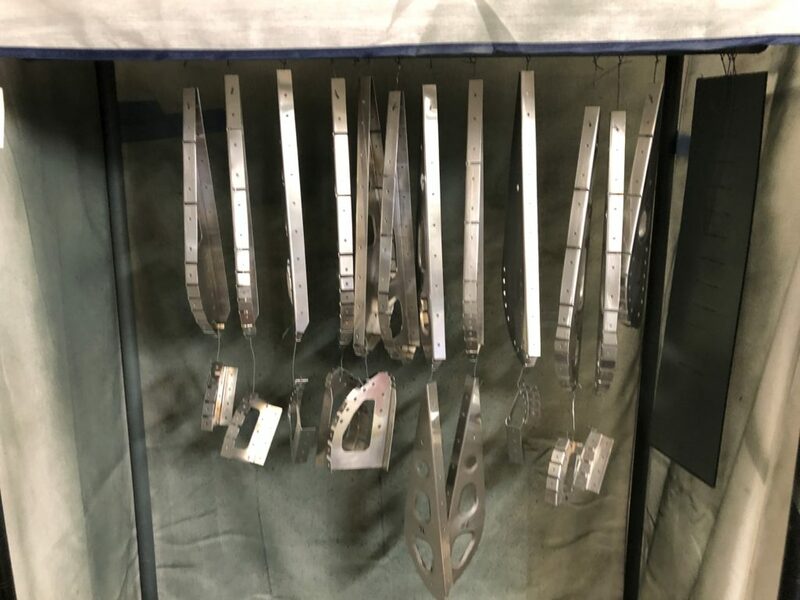 Although these nylon fittings have NPTF-type “dry seal” threads, the mating threads on the AN fitting are the NPT variety, so a thread sealer is recommended. 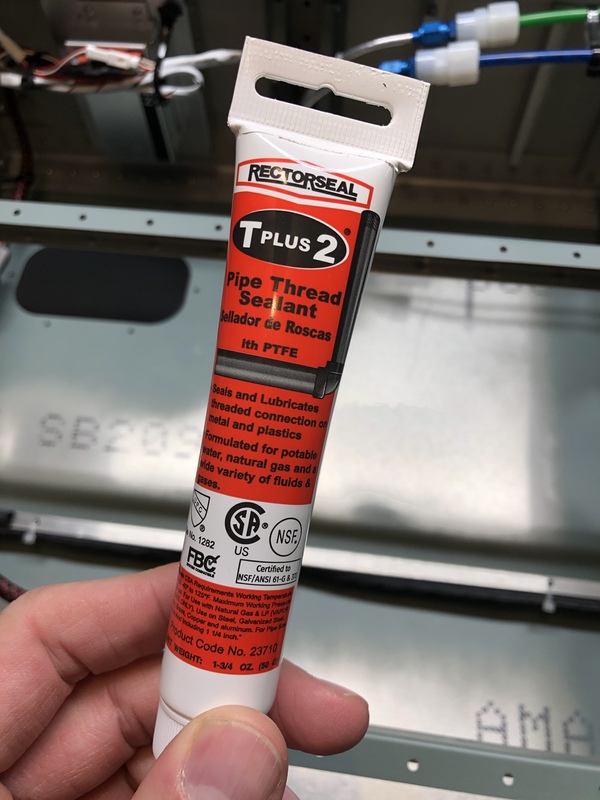 Unfortunately I can’t use the Loctite 577 that I would normally use (it’s only for metal fittings), so a search for a thread sealer suitable for both plastic & metal fittings led me to a product from Rectorseal, T Plus 2. It’s sold at Lowes for a few bucks. I applied Loctite 577 to the AN fitting nut, and TP2 to the threads for the nylon fitting. 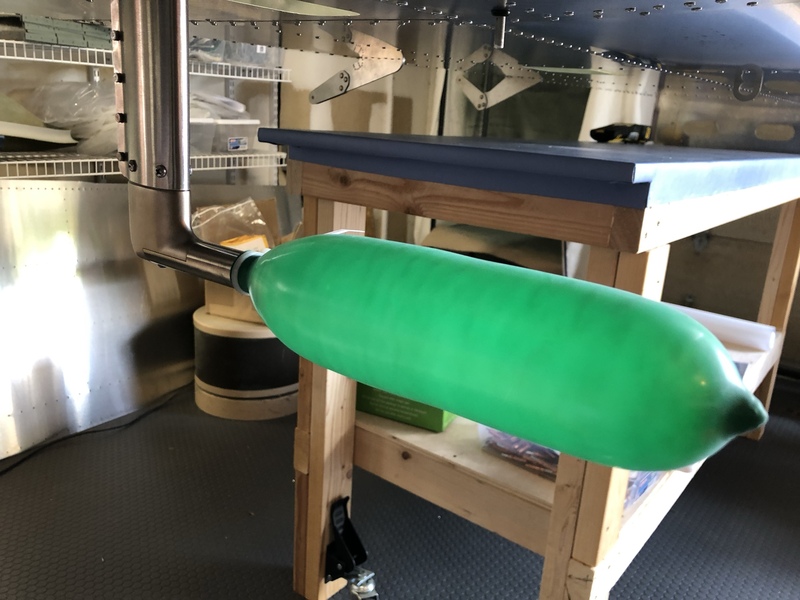 Leak checks were negative, with a balloon staying inflated for 24 hours. 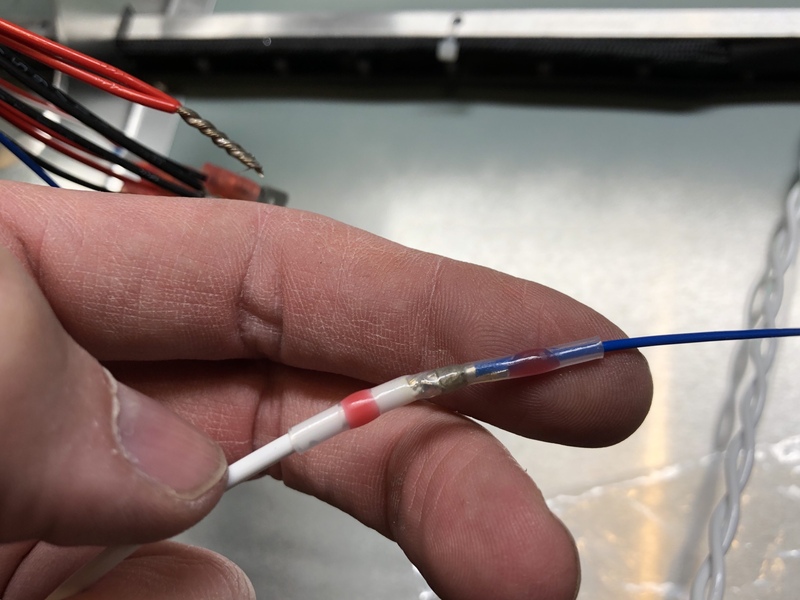 I tied together the ends of the blue and green tubing using a short section of the vinyl tubing that was originally supplied with the kit; heating it up with a heat gun made it flexible enough to fit over the stiffer nylon tube. 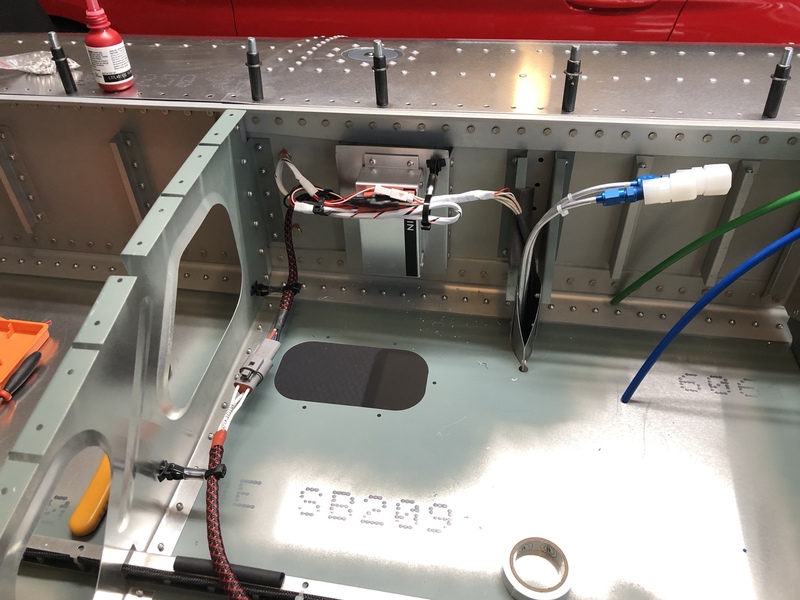 I did electrical checks next, to ensure wiring to the lights and pitot heater were good. Lights are pretty straightforward to check. 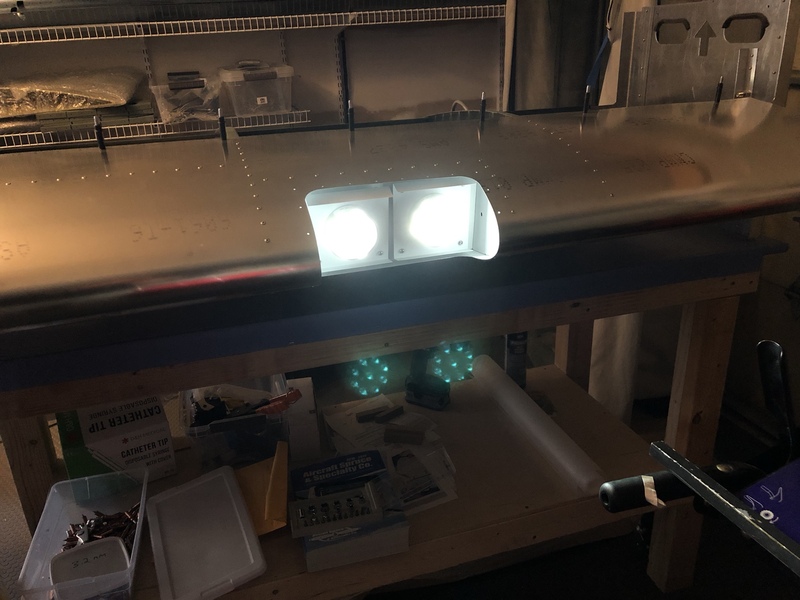 Although these Kuntzelman LTR lights are bright, I don’t like how they use a threaded lug for ground/return, which is the same lug that’s used to hold the light in place — this makes the whole wing become a return path, and I’m afraid that could lead to electrical noise problems later. 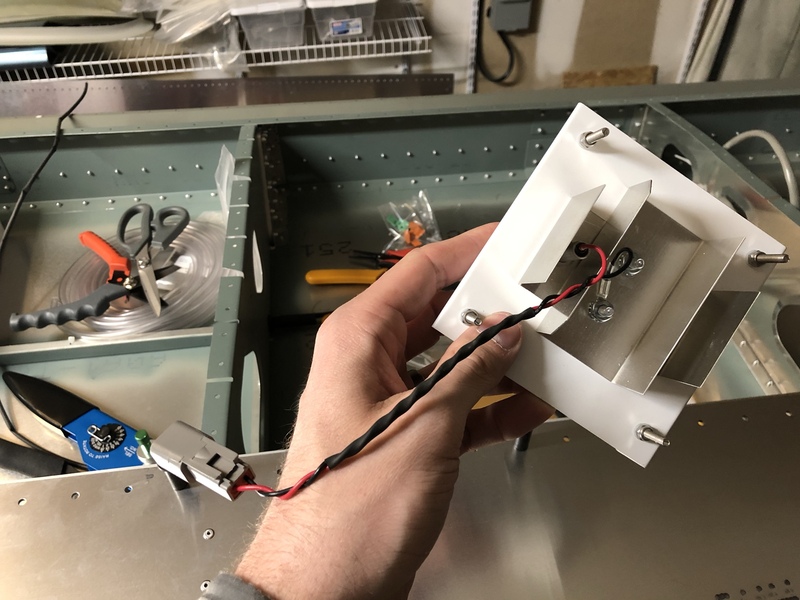 I ran a dedicated return wire for the lights, so I’ll have to figure out a way to keep the lights electrically insulated from the structure. Nonethess, the lights worked fine. I used a bench top adjustable power supply to apply 12V, and according to the ammeter on my power supply, these lights draw about 1.1 amps each, pretty efficient for the amount of light they throw out! 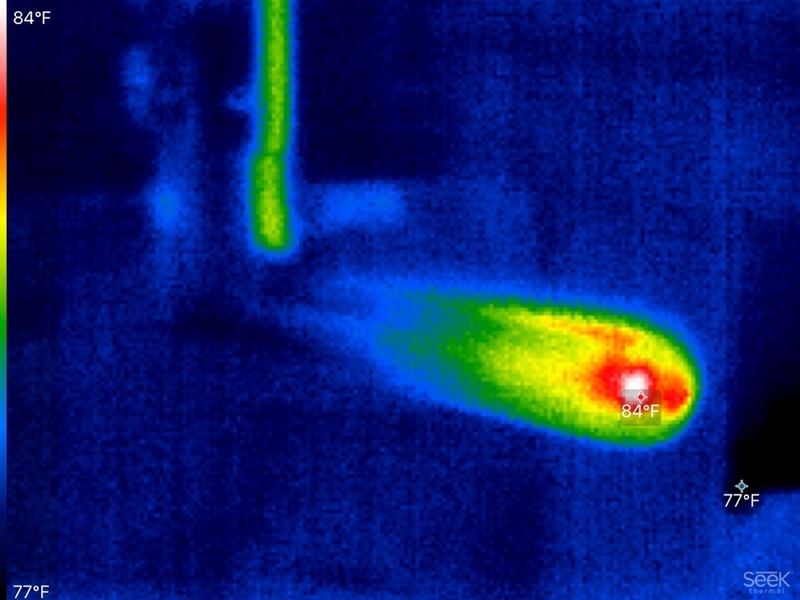 For the pitot, I had to use a different power supply capable of pushing more amps, so I used a DC switching supply rated up to 10A, then I used a Seek thermal camera that snaps onto my iPhone to watch the temp rise on the pitot. 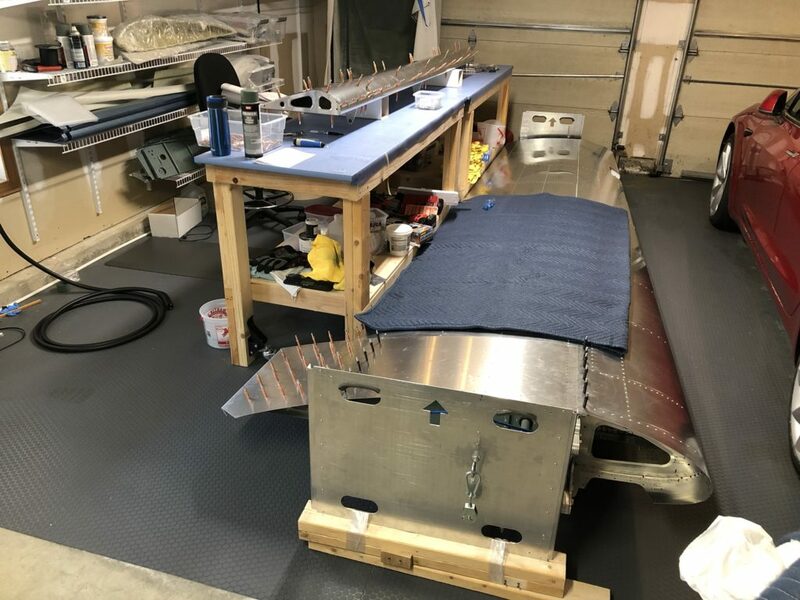 Now with these tasks done, I did some final inspections and vacuumed the inside of the wing before putting on the upper skins. Inner skin cleco’d in place. 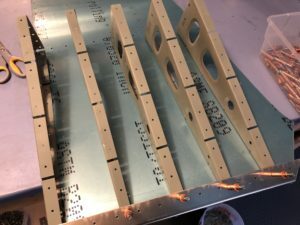 Holes for the ribs and spar line up fine, but the holes for the two upper stringers don’t line up so well. 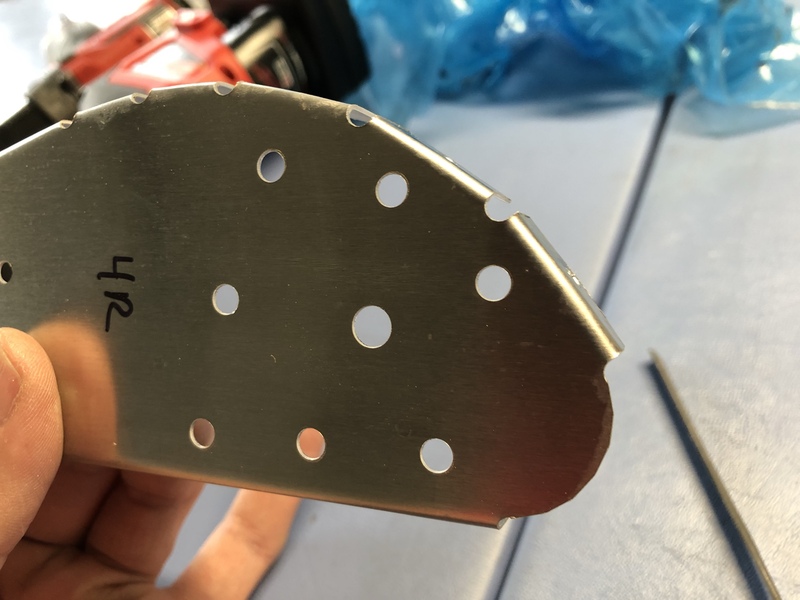 Most of the holes line up ok using clecos, but the alignment is not perfect so I’m going to have to use a chucking reaming to open the holes up, which will create more metal shavings.. which means I have to vacuum one more time. 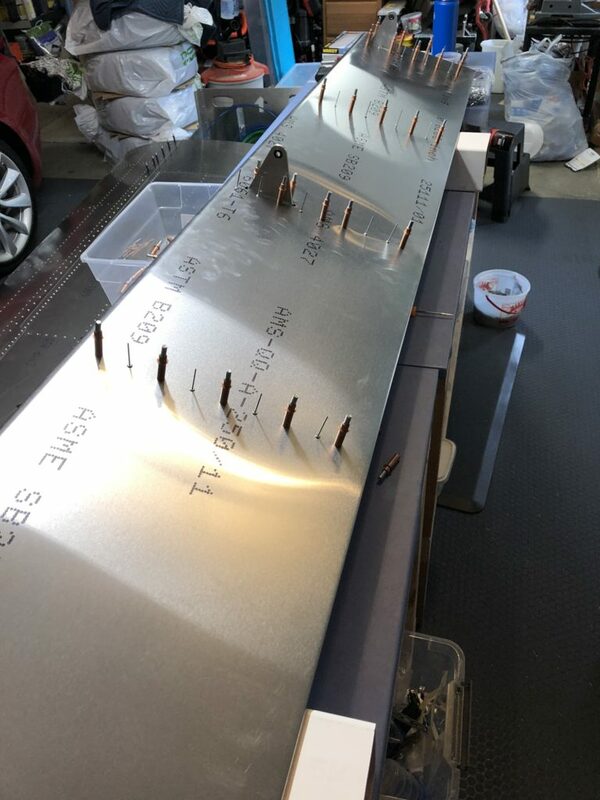 So I’m going to do that, pull the skins off one more time to vacuum up the shavings, then I should be ready to rivet the skins down and move on. 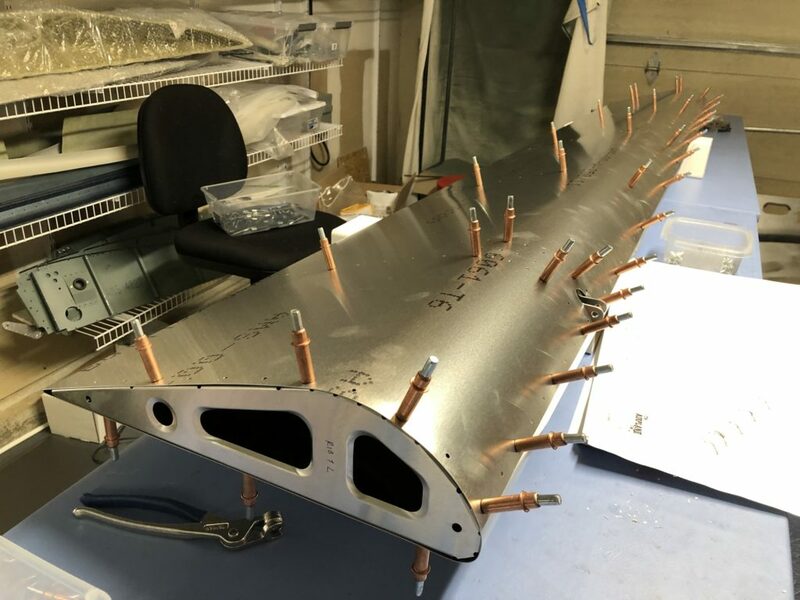 Today I continued attaching the fuel tank to the wing, riveting everything but the 4mm rivets at the back edge of the top skin — I’m leaving these cleco’d for now until it’s time to attach the top wing skins. 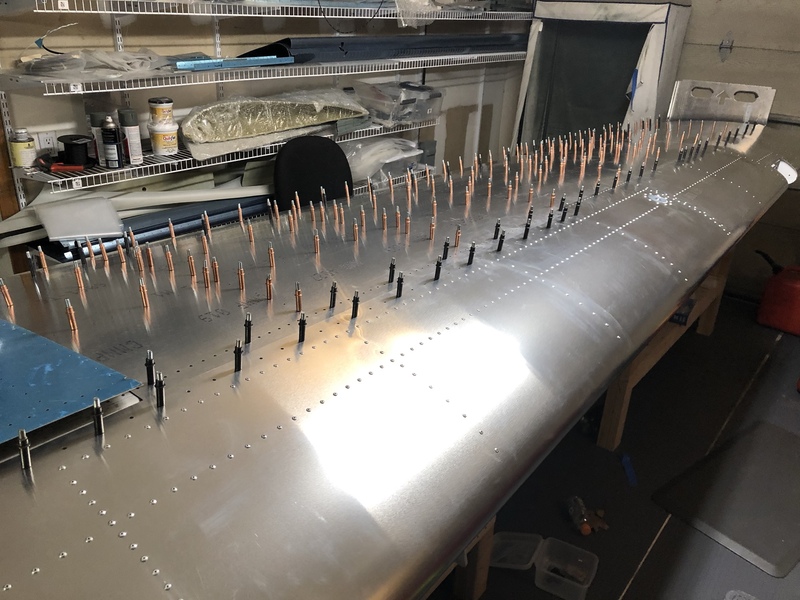 I also had a bunch of rivets to put into the outside nose skin… I think I left these until now to ensure the area where this skin overlaps with the fuel tank lines up okay (it did!). 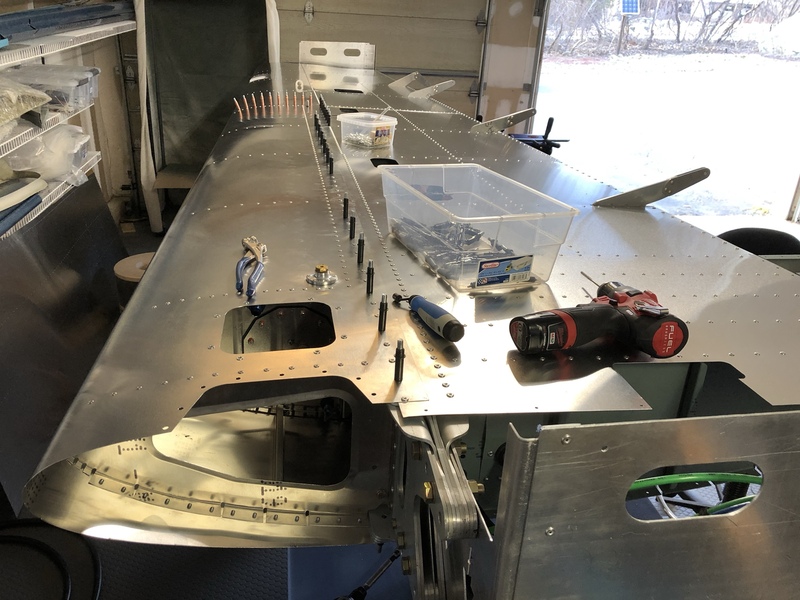 I decided to switch over to some wiring, so that I could finish off the pitot install. 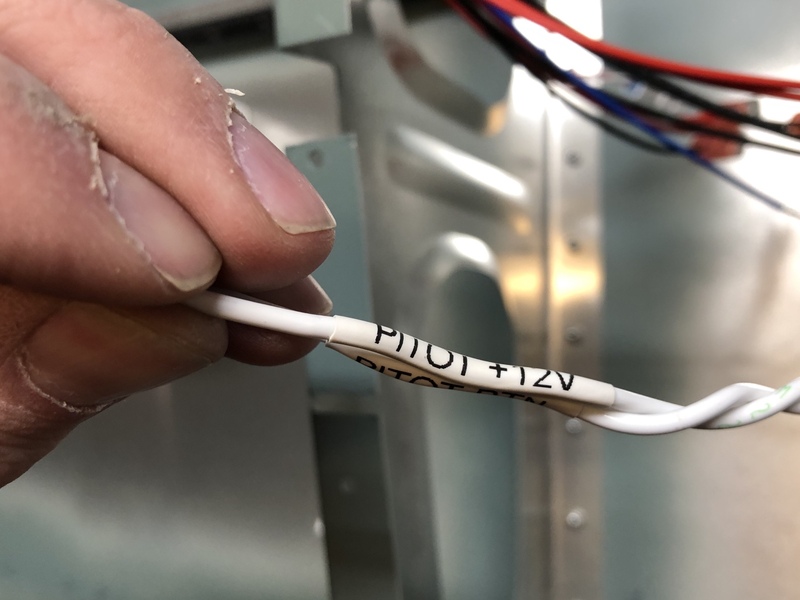 The Deutsch DT connectors I bought are sized for 14-16AWG wire, which I what I ran to the pitot heater; however, the wires coming from the heater controller are 2x18AWG, so I used some sealing splices to join up the 2 wires to a single 14AWG. Same thing for the temp sense line coming from the controller, although this was a single smaller 22AWG wire. 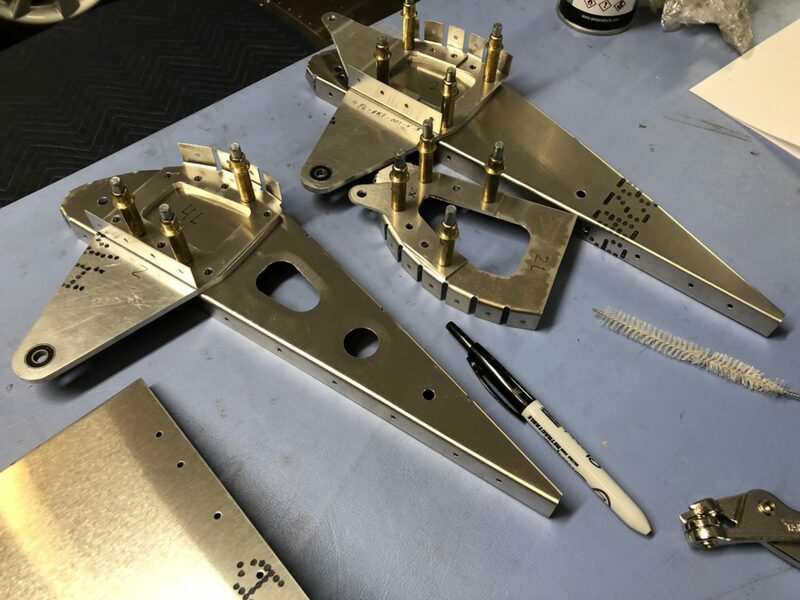 After these preparations, I could then use my crimping tool specific to the solid barrel-style crimp terminals used on these Deutsch connectors. 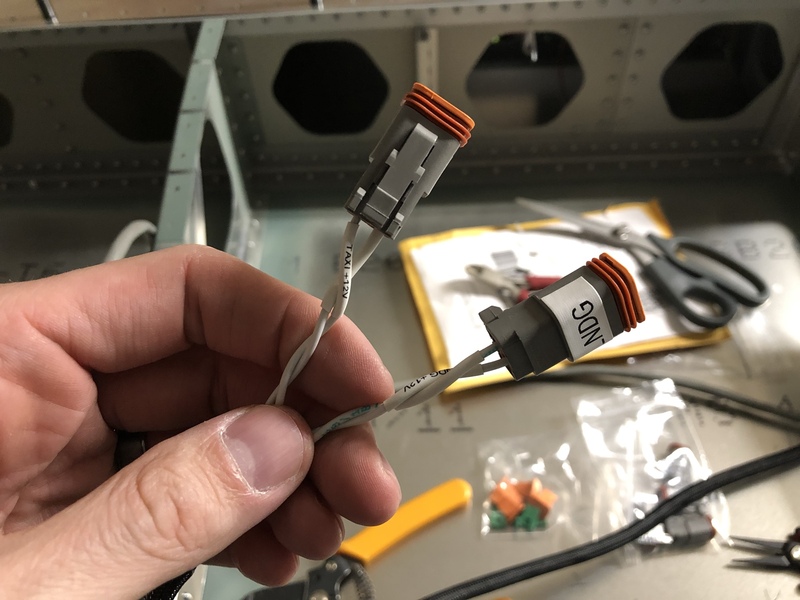 I love this style of terminal, it’s very sturdy & secure, and similar to what is used on military-style D38999 connectors, but for a much more affordable price. 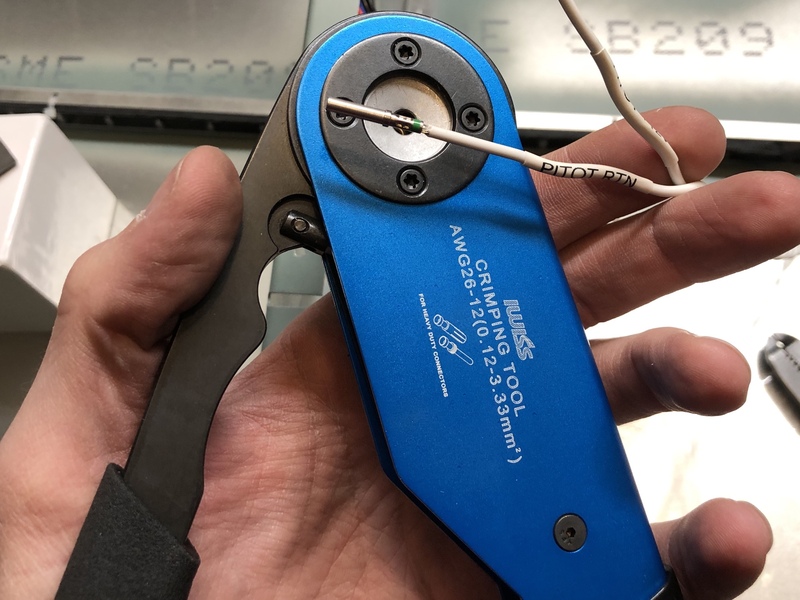 After crimping, I install the terminals into the connector body and install the wedge locks. As you can see in the next photo, I also dressed up the wiring with a sleeve. 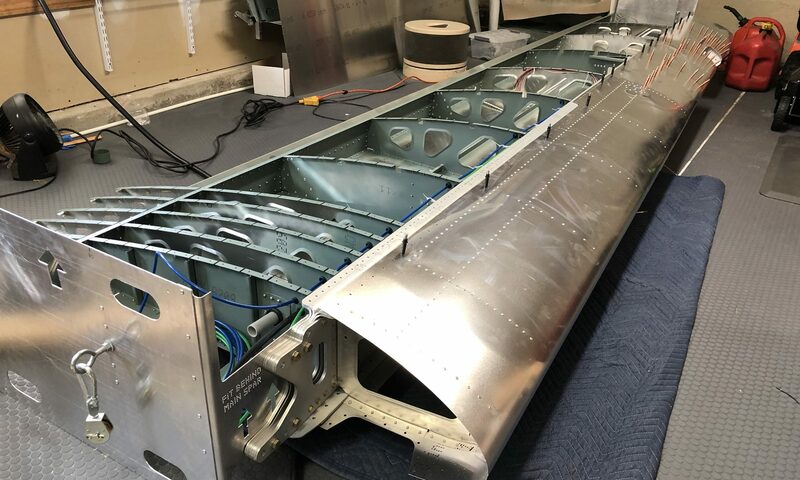 Finally, I mounted some standoffs into the rib to secure the connector and wire so that it won’t interfere with the aileron torque tube. I don’t have this tube yet, so I assume it comes with the fuselage kit. 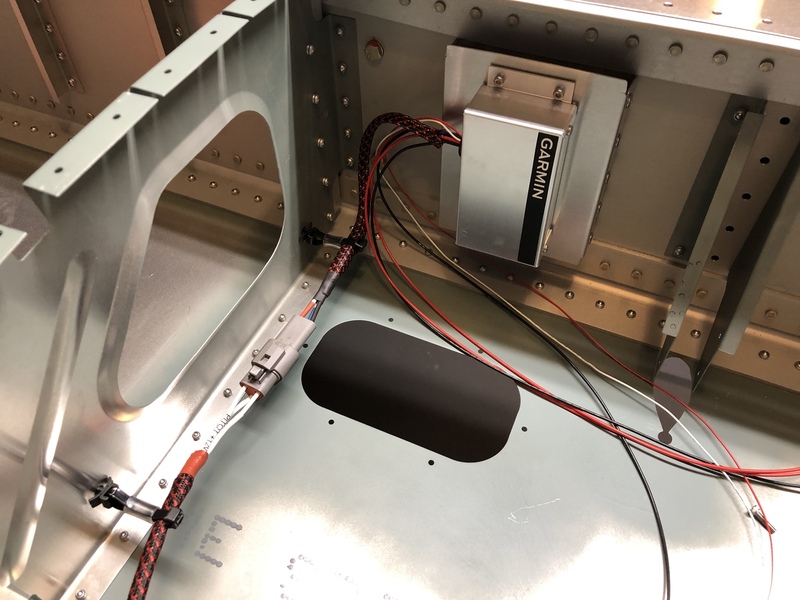 I started installing similar connectors for the taxi and landing lights, but I had enough for today. 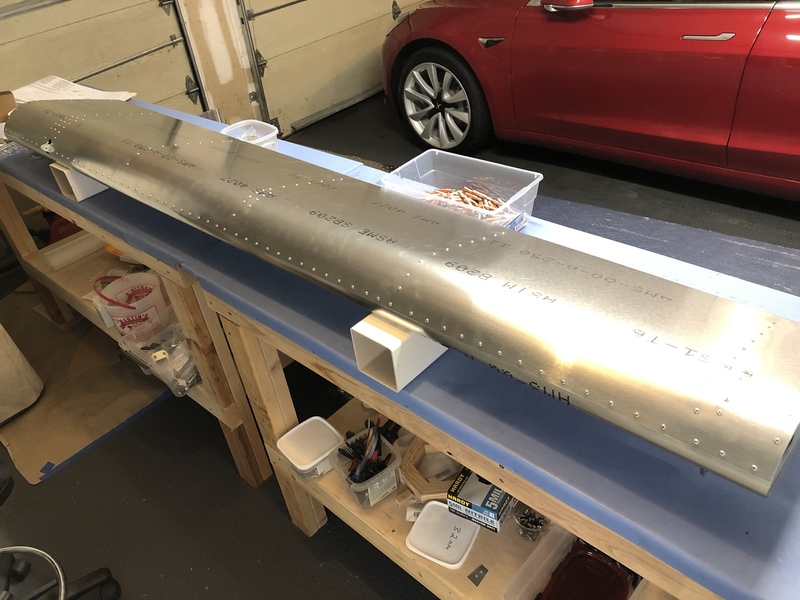 Fresh back from my work trip to Germany, I was ready to attach the fuel tank to the wing. 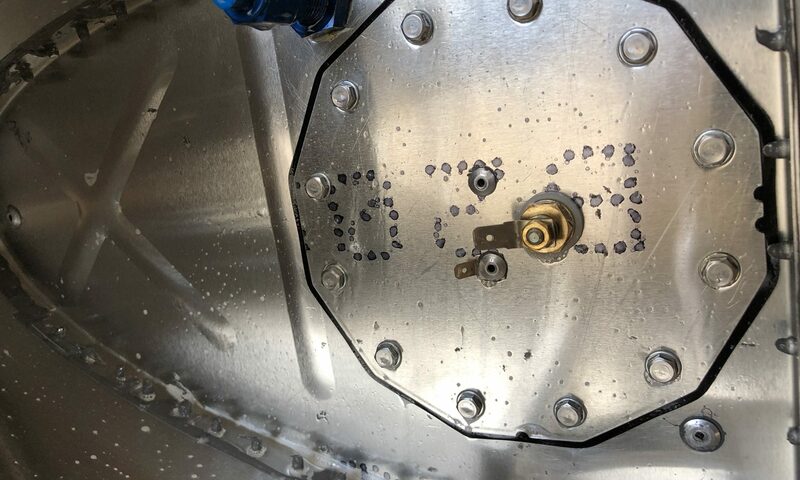 First, I wanted to check that all the bolts are torqued correctly on the fuel sender cover, but I wasn’t too sure about the correct torque value. 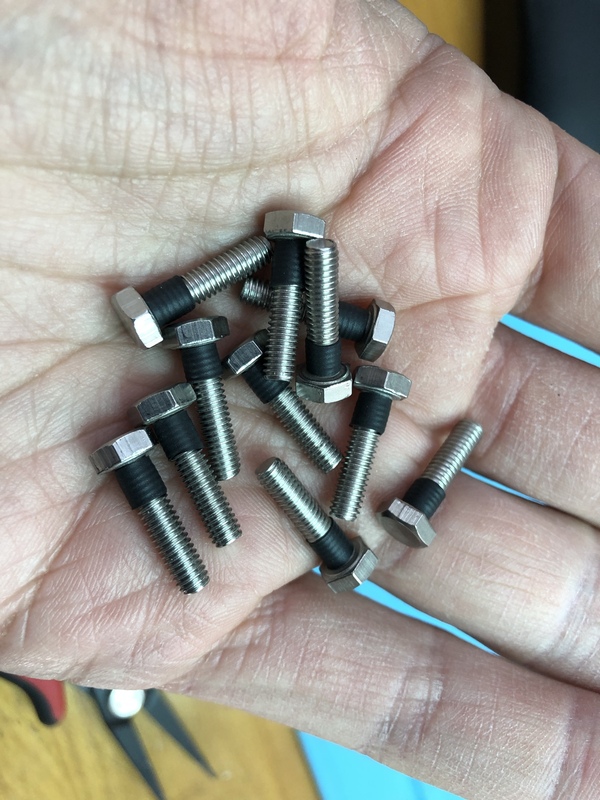 The screws provided in the kit are M4 x 16mm hex cap, and the parts list calls them stainless steel, zinc-coated. This doesn’t seem to be a normal alloy/finish combo, so I couldn’t find what torque to use. I chose a value of 20 in-lbs of torque, somewhere between class A2 and class 8.8 from this helpful chart. This seems about right, since M4 is similar in size to an AN3 bolt, which should be torqued 20-25 in-lbs. After setting the torque, I applied a little dab of paint (nail polish) to each bolt head so that I know they’re already torqued. Attaching the tank is a little tricky. 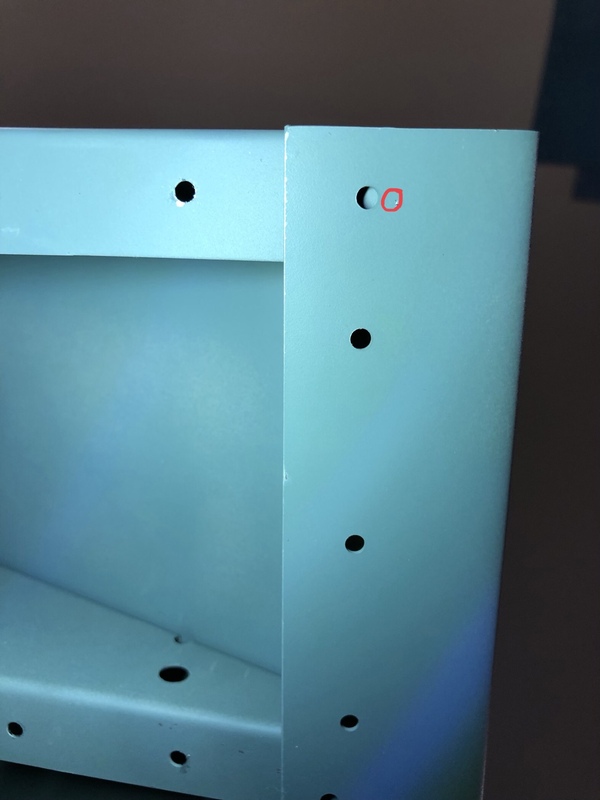 The z-brackets / channel brackets must bolt to the main spar, but alignment is not guaranteed, and the AN3 bolts don’t self-center. I had to borrow a trick from Craig Maiman, which was to grind down the end of the bolt to give it a taper, so that it could guide itself into its mating nutplate. I think floating nutplates would have been a better design choice here. 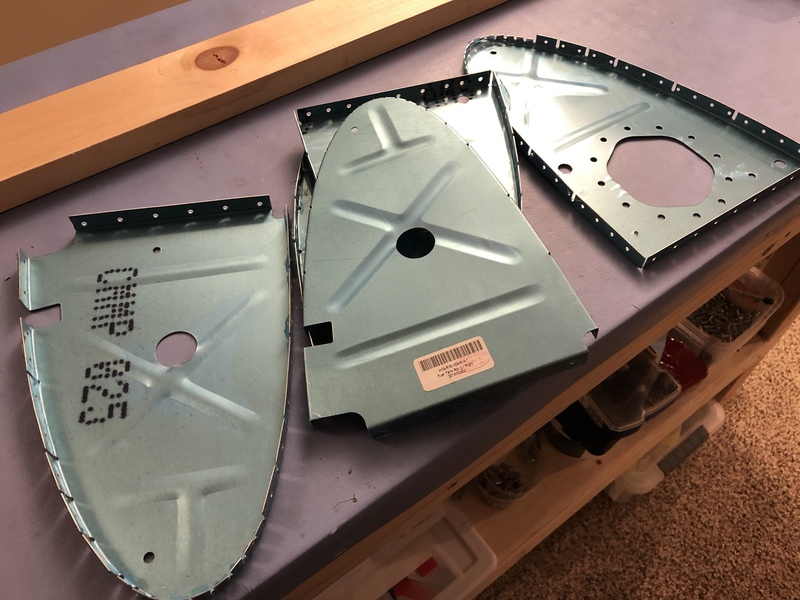 Once the tank was attached, I found some pretty bad misalignment of rivet holes on the bottom skin, so I spent quite some time filing and then reaming these holes so that I could get the clecos and rivets in. The wing is looking pretty good with the tank attached. 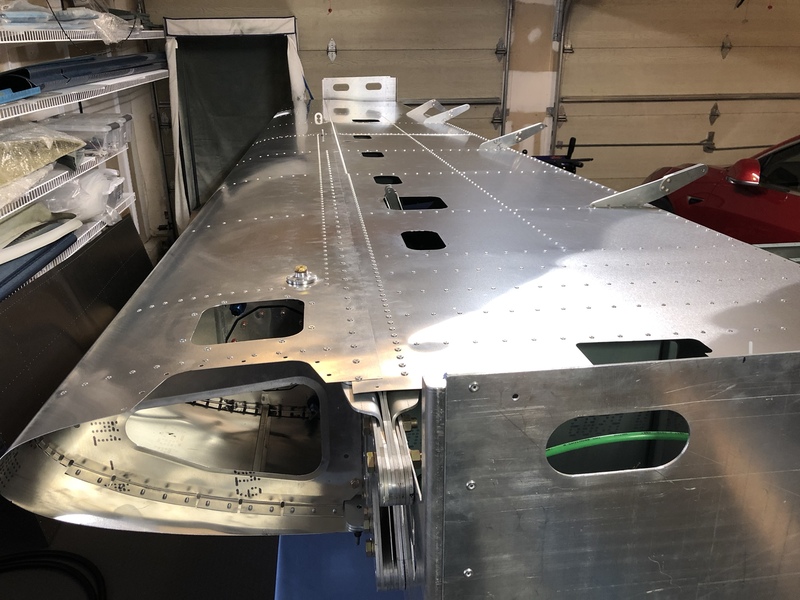 I’m not quite finished putting in the rivets – tomorrow I’ll finish the bottom side and then flip the wing back over to the top to finish riveting. 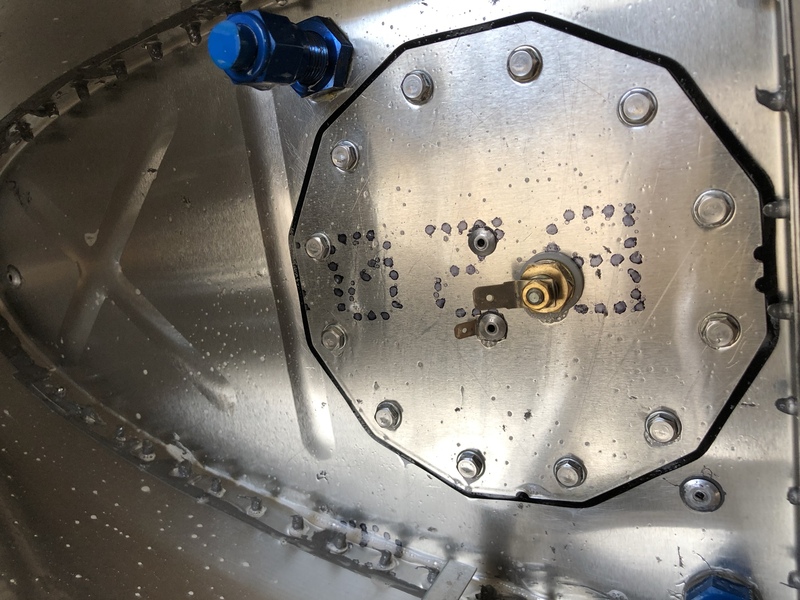 After the required minimum 3 days elapsed to allow the sealant to cure, I was able to perform leak tests on my left fuel tank this past weekend. 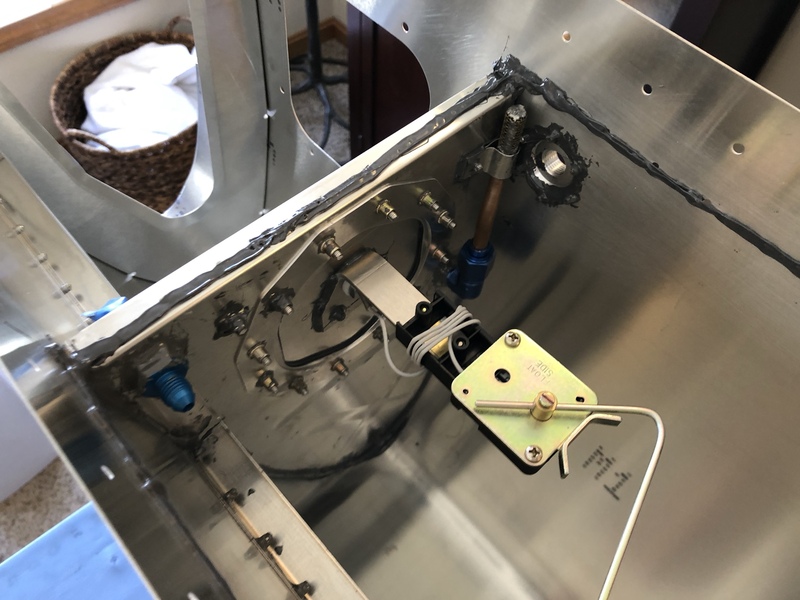 I closed off the vent and fuel supply fittings, and then used a bicycle pump tethered to the fuel return fitting via 1/2″ ID tubing to pressurize the tank. 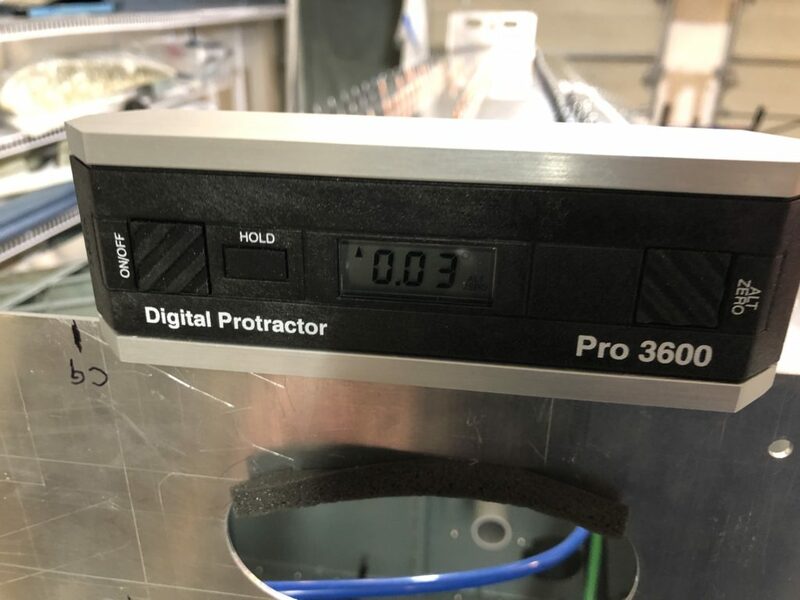 The instructions say no more than 1 bar of pressure, which is a little less than 15psi – pretty low to register on the pressure gauge on the pump, so I just gave it a few pumps. You can see the skins start ballooning up right away, so I knew I was getting air into the tank! 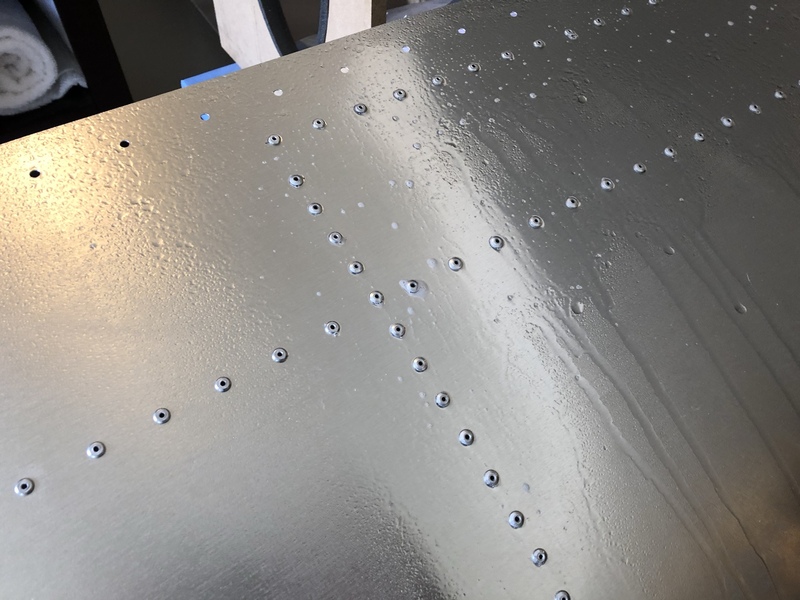 All of the surfaces along the rivet lines were bubble-free, but my first attempt to close the fuel level sender cover didn’t work. I really didn’t want to apply sealant to the bolts for this cover, so that it will be easier to service in the future. 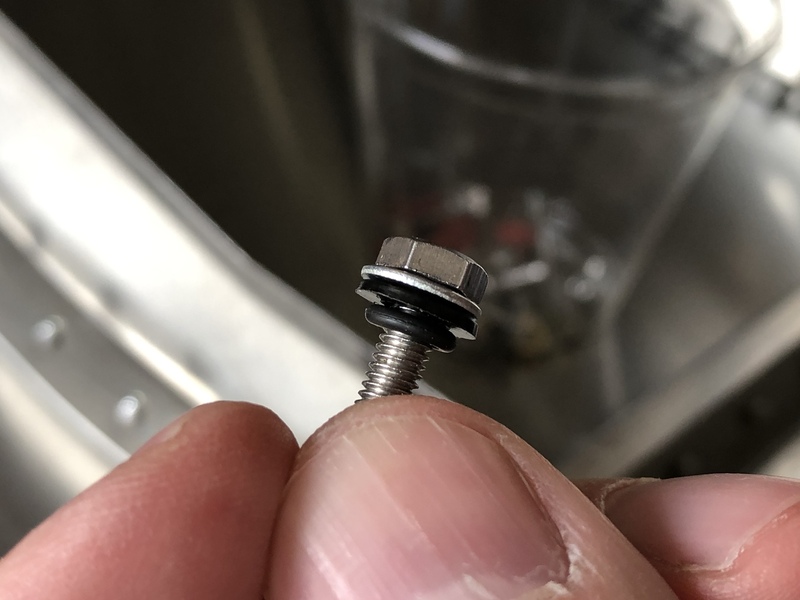 My first attempt involved using nylon washers on the M4 bolts in place of stainless washers, but it just wasn’t enough of a seal. I tried adding small Viton o-rings on the screw, at the end of the threaded shaft. In theory this will work well – but the problem with this idea is that the o-ring gets squished too much as the screw is torqued down, and eventually causes the o-ring to tear. 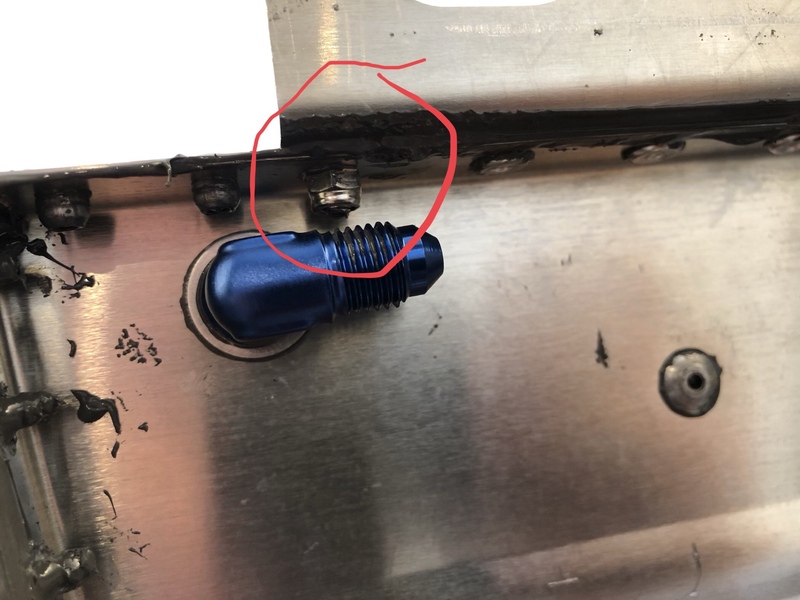 I tried chamfering both the washer and the cover surface, to give the ring some place to expand into as the bolt is tightened, but there was still too much tearing. 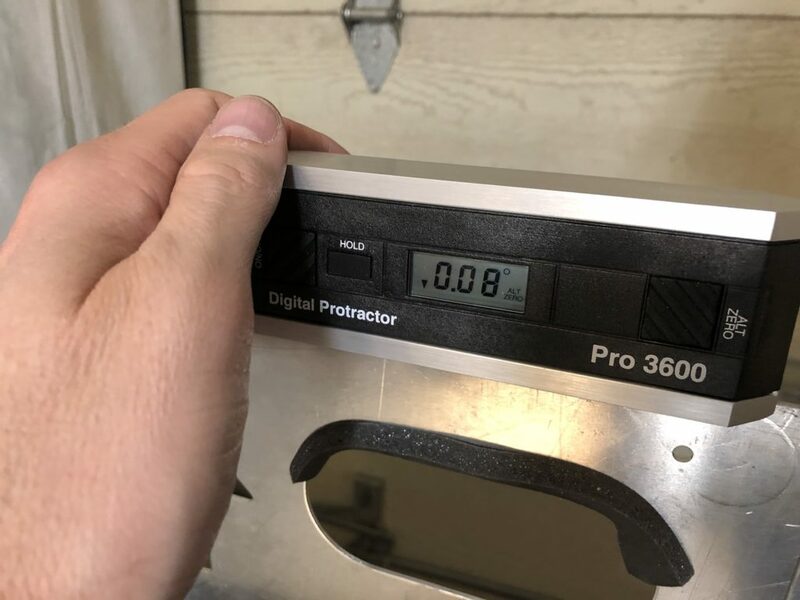 My third idea was to make flat washers out of the same material as the custom gasket between the cover and the rib, but this material is also pretty squishy (75A durometer) and wants to tear before getting to the nominal 50 in-lbs of torque. There is a company that makes sealing washers called Seeloc, but they don’t appear to be fuel resistant, and at $2 a piece they are quite expensive. 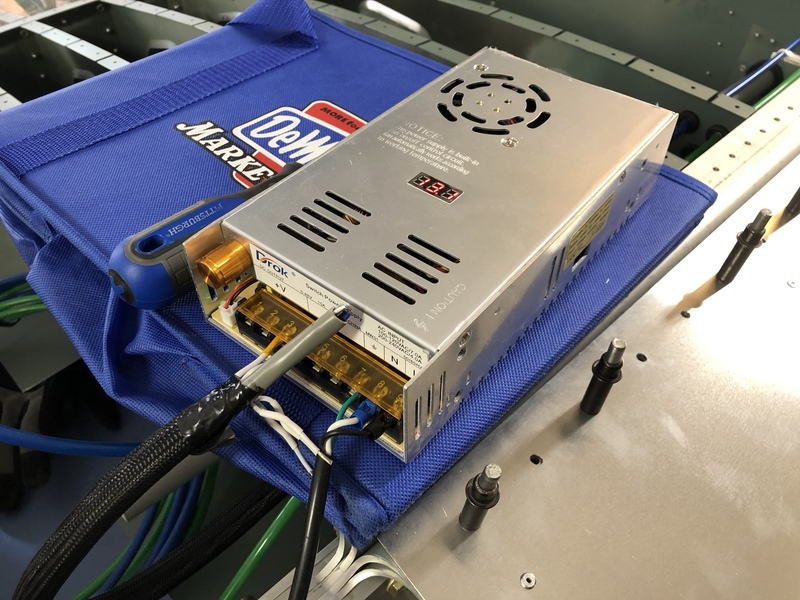 Their solution appears to work because the washer and seal are designed correctly so that the seal can squish down and form a tight seal without tearing. 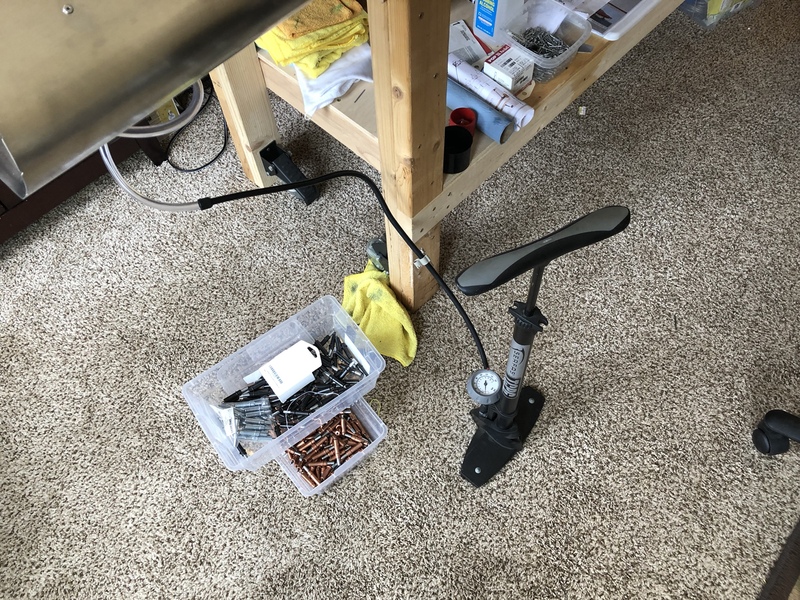 My fourth and final idea was to apply a short section of heat-shrink tubing to the last third of the bolt shaft closest to the head, so that a seal is formed as the bolt is tightened. The heat shrink I’m using is made from polyolefin, which I learned is resistant to fuel. 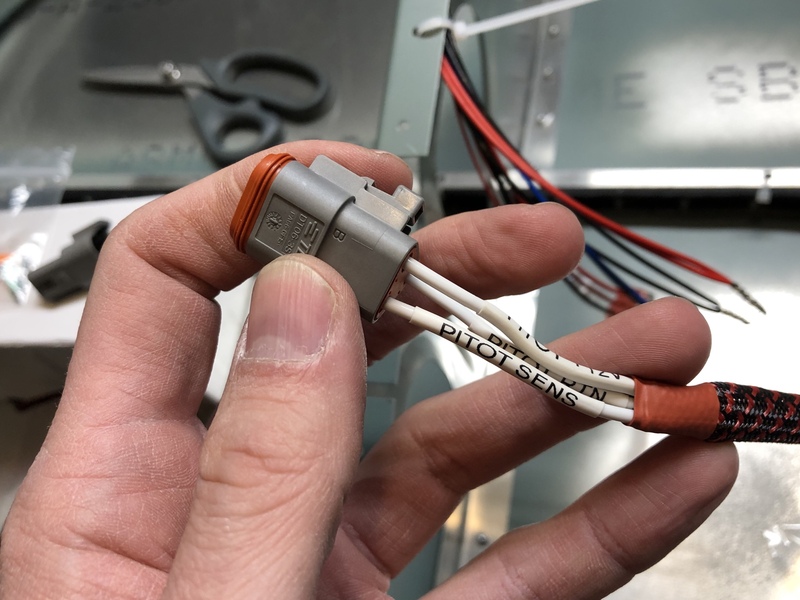 The idea is similar to using Teflon tape, but without the worry of bits of tape tearing off and potentially clogging something in the fuel injection system. 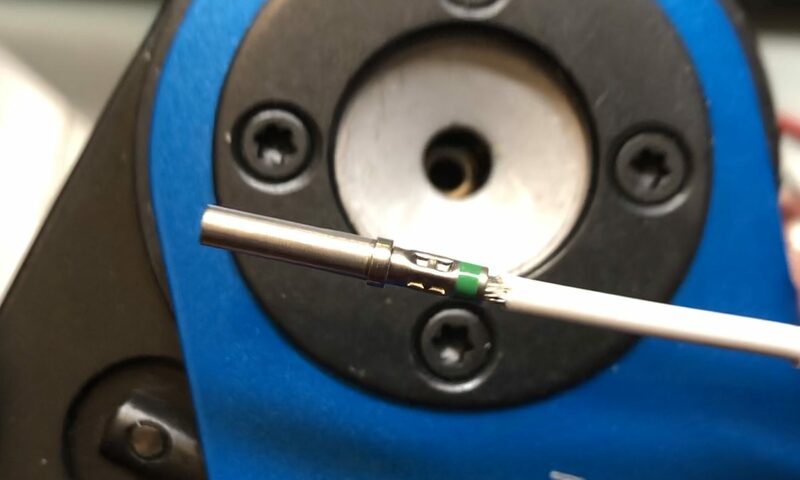 The heat shrink tubing seems to have done the trick – I can feel the resistance of the tubing as it starts biting into the threading of the rivnut, and it torques down fine. I backed a screw out to make sure it doesn’t tear apart and leave debris, and all looks fine. Since this little piece of tubing does not extend past the end of the rivnut and into the fuel tank, I feel confident that I won’t have debris entering the fuel system. 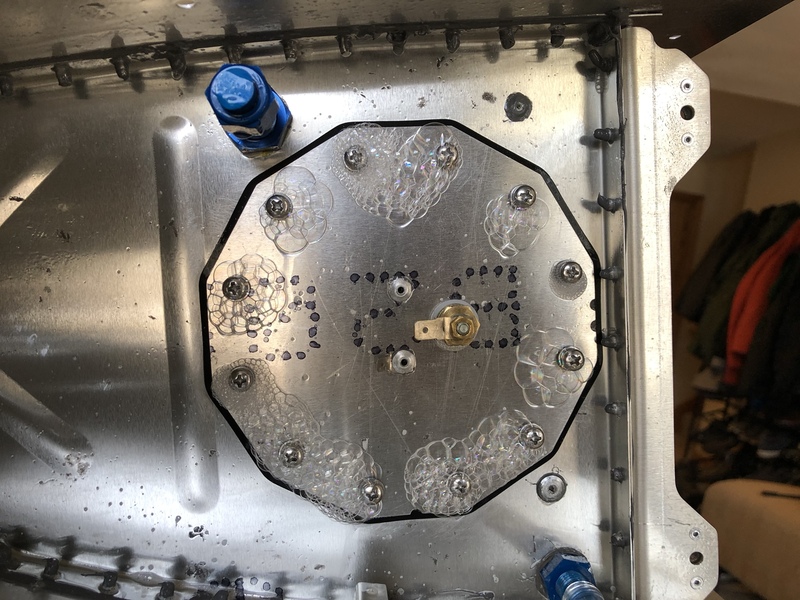 One more pressure test, and this time no bubbles! 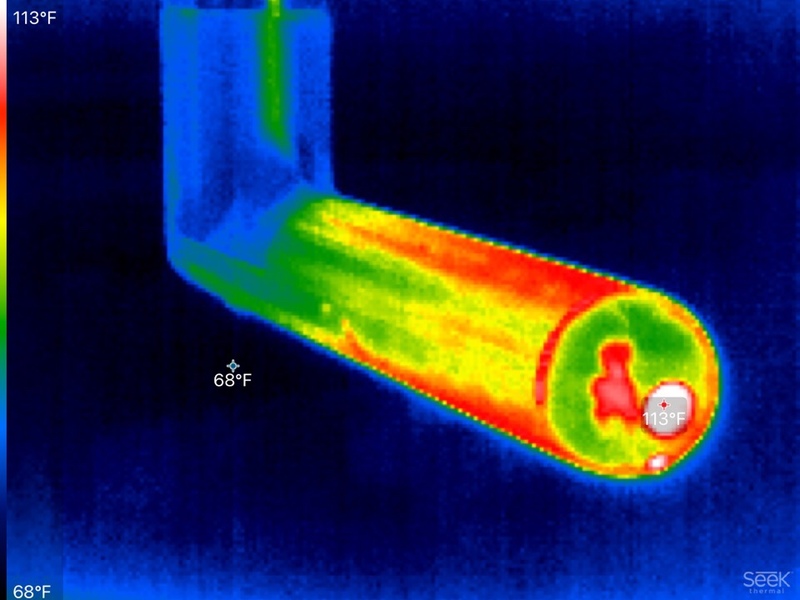 So it looks like my heat shrink tubing solution will work. I’m on another business trip this week to Germany, so I won’t be able to make any more progress this week until the weekend. I had hoped to finish up the other tank before my sealant expires at the end of the month, but I don’t think I’ll be able to. I wonder if it’s still safe to use the sealant? I’m using the Flamemaster CS3204 sealant recommended by TAF, and it’s been in my cool dry garage / basement all winter. 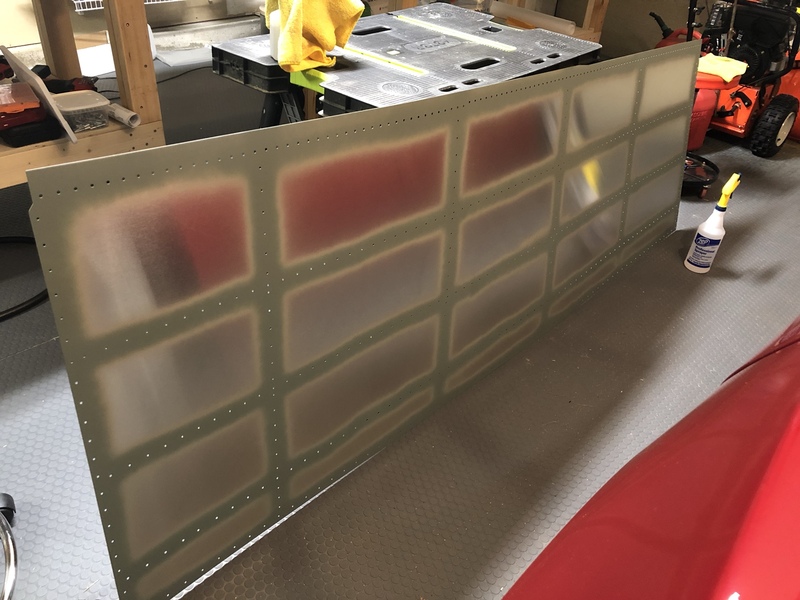 Since I have all the fuel tank build steps fresh in my mind, I’m building the other one now. It took me about 14 hours to build the first one, not including leak testing and remediation (if needed). Let’s see how long it takes the second time? 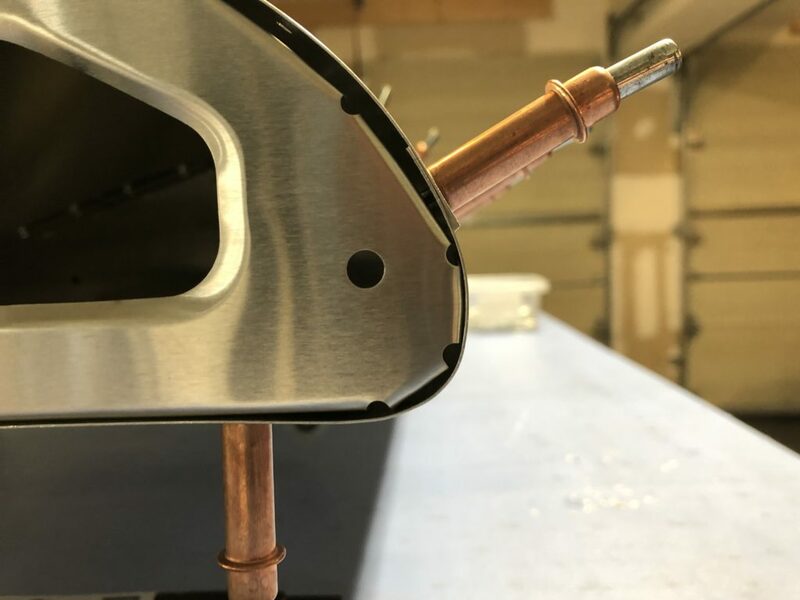 This weekend I made it my goal to close up the left fuel tank. 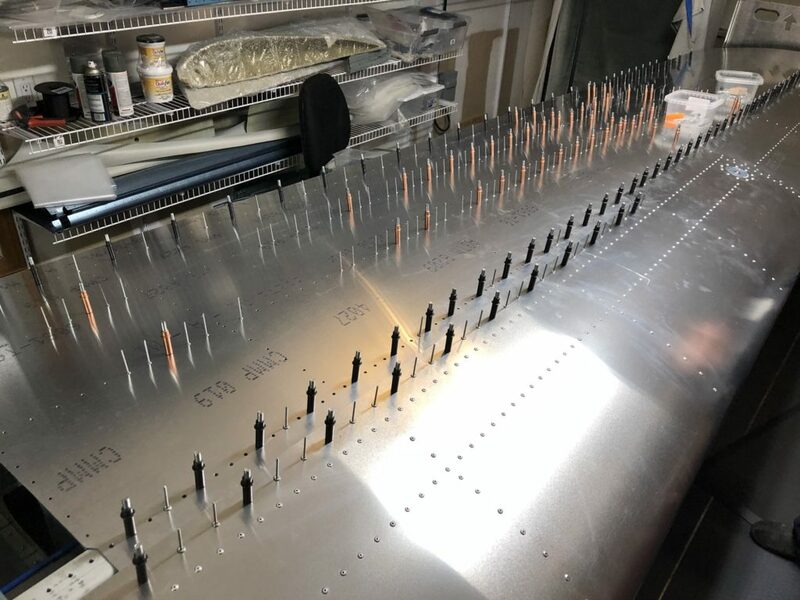 After one last inspection of the tank’s inside for debris, a final cleaning of all the mating surfaces, and staging all the rivets, screws, brackets, and tools, I mixed up a 66g batch of sealant and got to work. It’s a lot of work to complete within the 2 hour working time of the sealant. 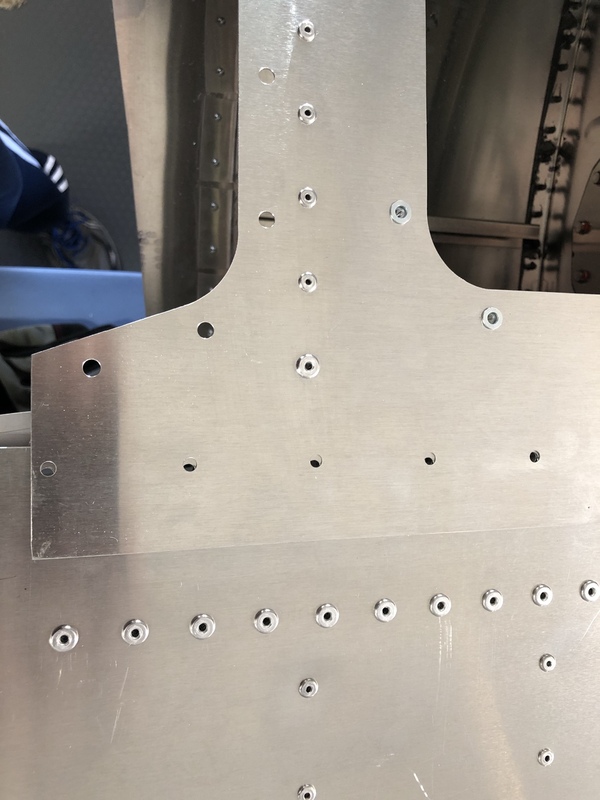 I ran into one problem that I didn’t quite anticpate – the last U-shape bracket that attaches the tank to the main spar is too tight to get a rivet tool into – so I have a mix of rivets facing opposite directions. 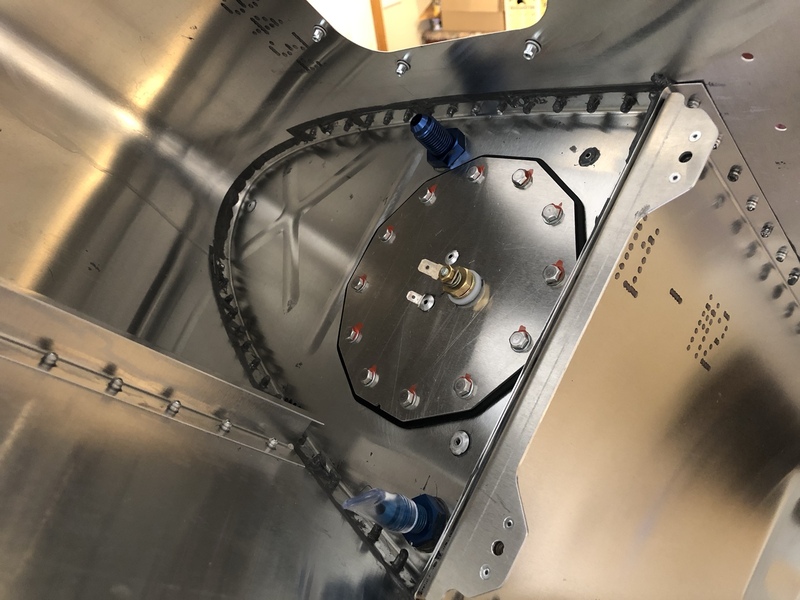 But one in particular, just above the 90° fitting for the vent, had no clearance on either side to get in a rivet puller. I have no idea how you’re supposed to be able to set a rivet in this location! 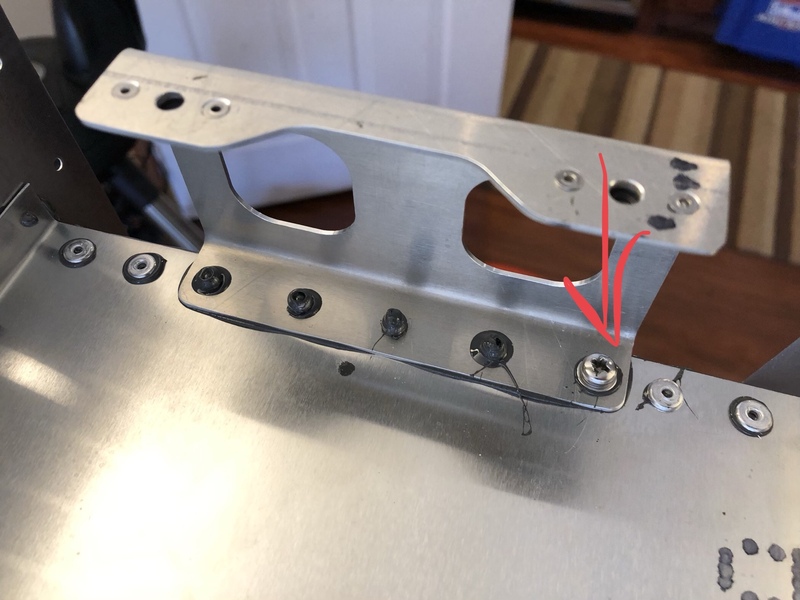 Some quick thinking led me to a solution to use an M4 screw with nyloc nut in place of the 4.0mm rivet. 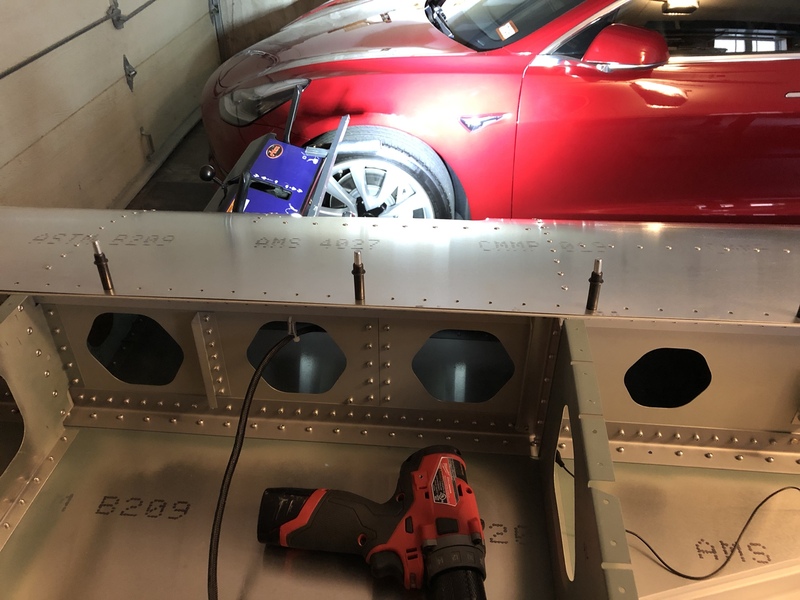 After setting all the rivets for the brackets, it’s a race against time to temporarily mount the tank to the wing to set the rivets that secure the back wall of the tank. 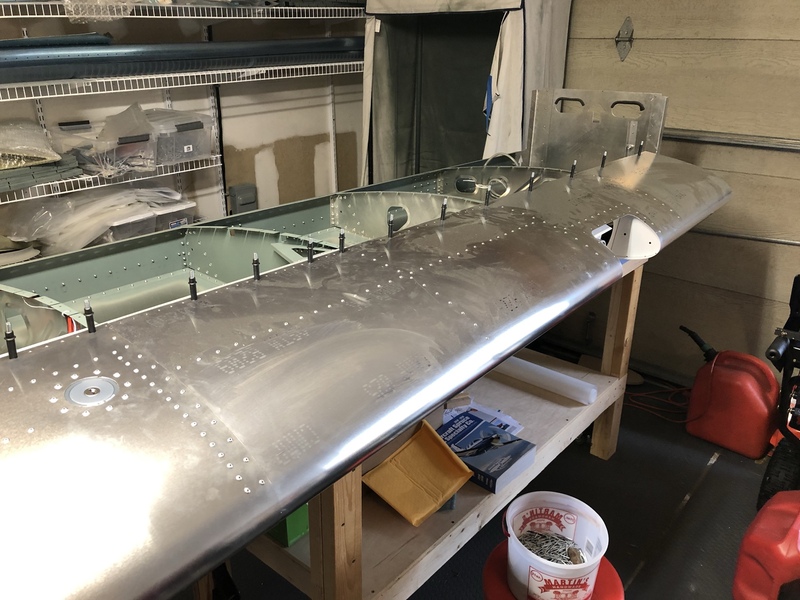 Of course, I had some trouble getting the tank lined up correctly to the wing, but once I did, the rivets went in pretty easily. 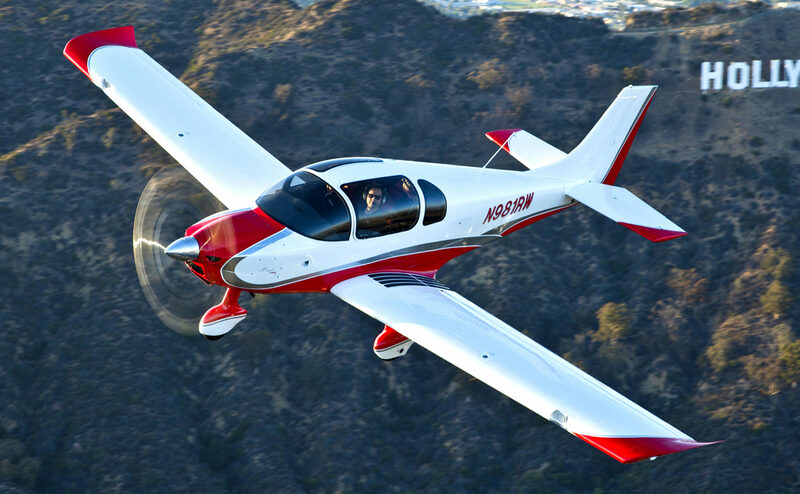 Finally – a complete leading edge! Now the tank must sit like this for 3 days for the sealant to cure, then I get to take the tank off again and perform a leak test.